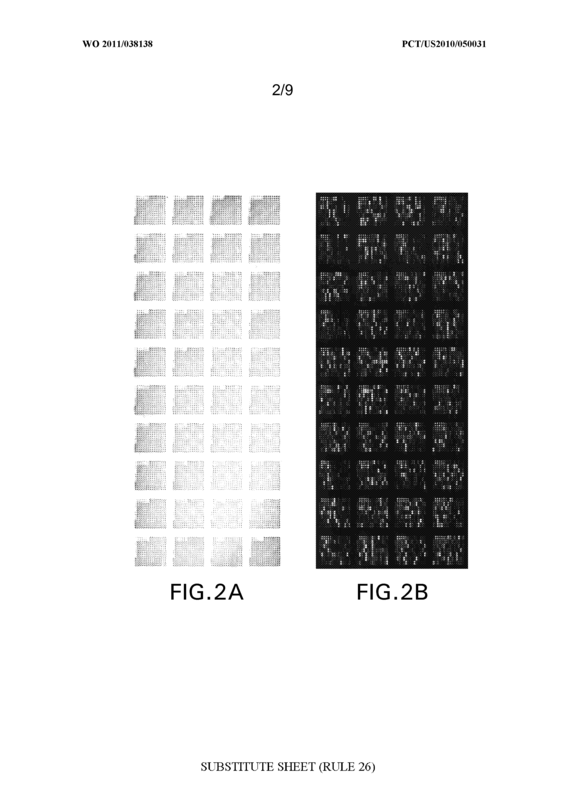 Illustrative embodiments herein disclosed relate to protein arrays, methods for making the arrays and methods for using them, among others. 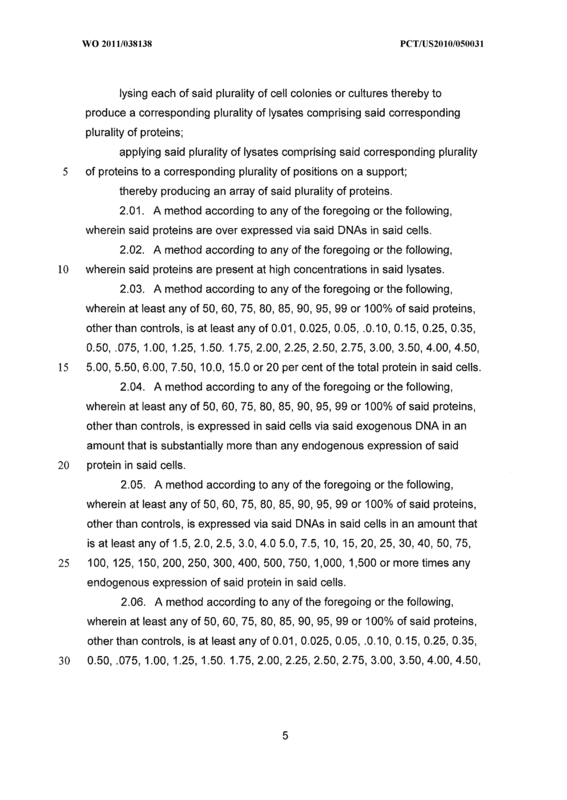 In some embodiments known proteins representing at least 50% of the loci in the human genome are arrayed in known positions on a support. 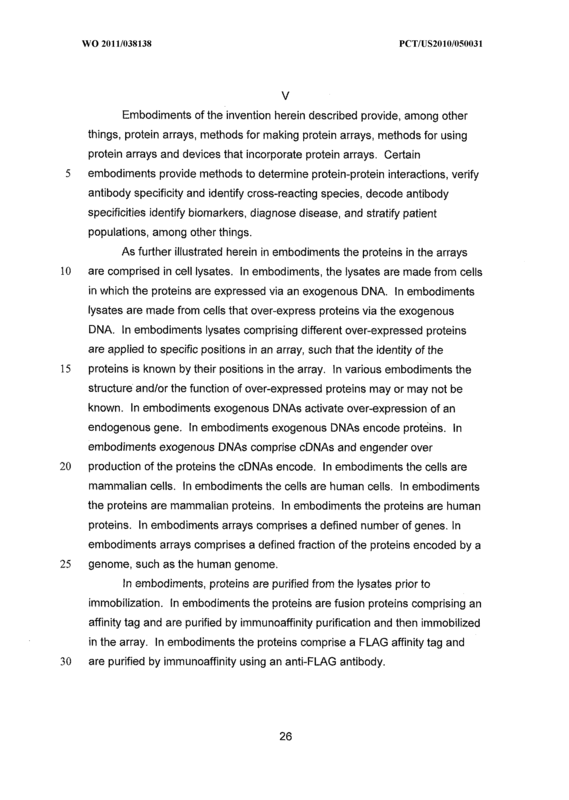 In some embodiments arrays are made of proteins purified from cell lysates by affinity binding to the support. 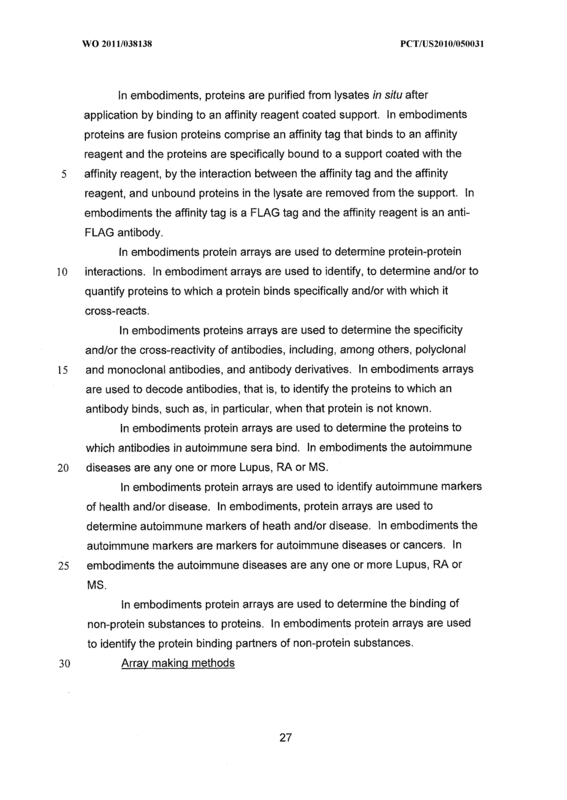 In some embodiments protein arrays are used to decode the binding specificity of antibodies. 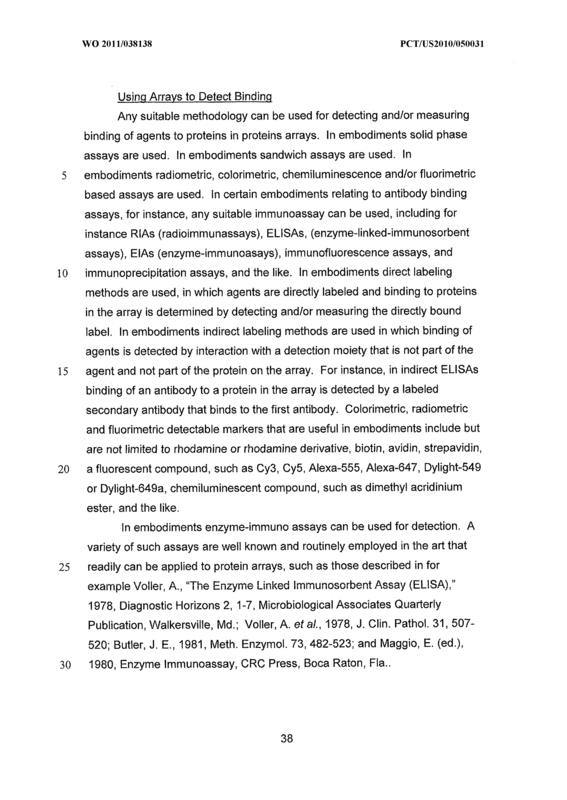 In some embodiments protein arrays are used to diagnose auto-immune disorders. 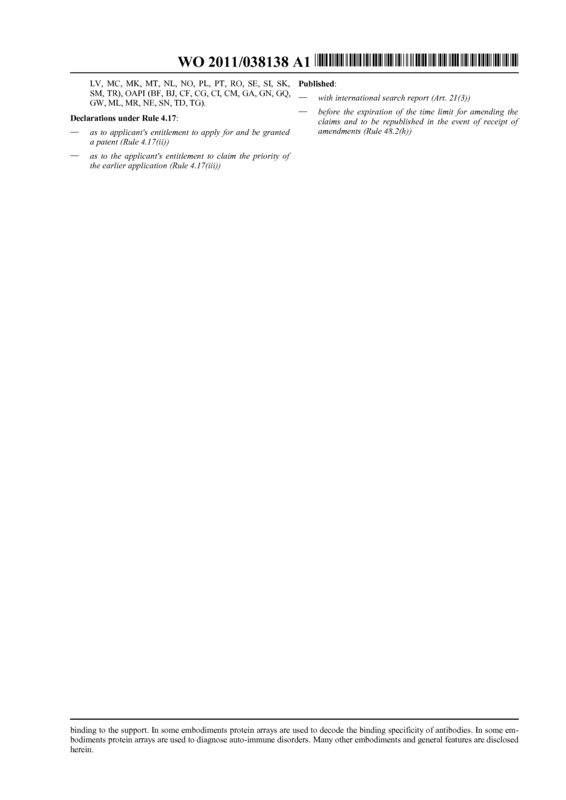 Many other embodiments and general features are disclosed herein. 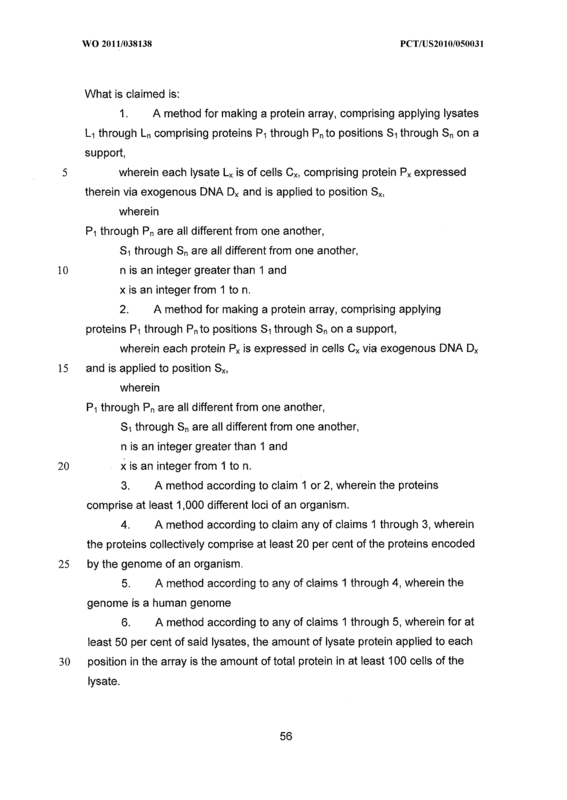 x is an integer from 1 to n.
A method according to claim 1 or 2, wherein the proteins comprise at least 1 ,000 different loci of an organism. 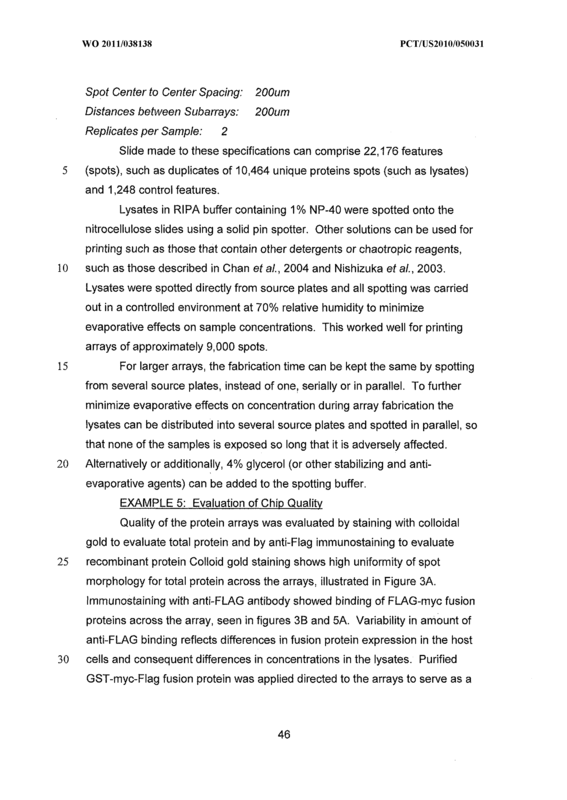 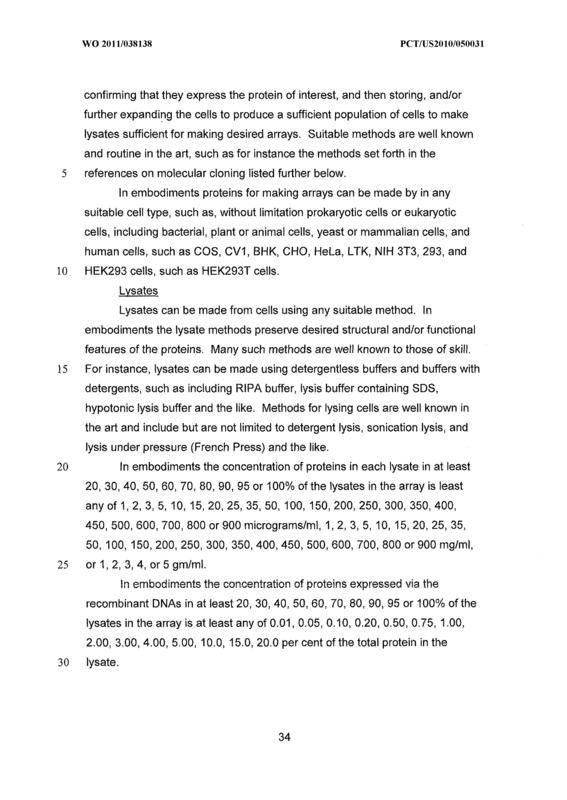 A method according to any of claims 1 through 5, wherein for at least 50 per cent of said lysates, the amount of lysate protein applied to each position in the array is the amount of total protein in at least 100 cells of the lysate. 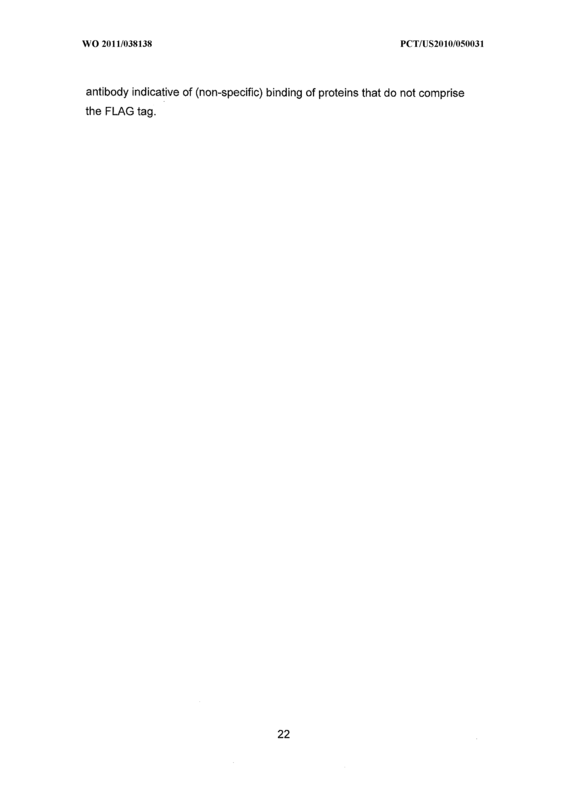 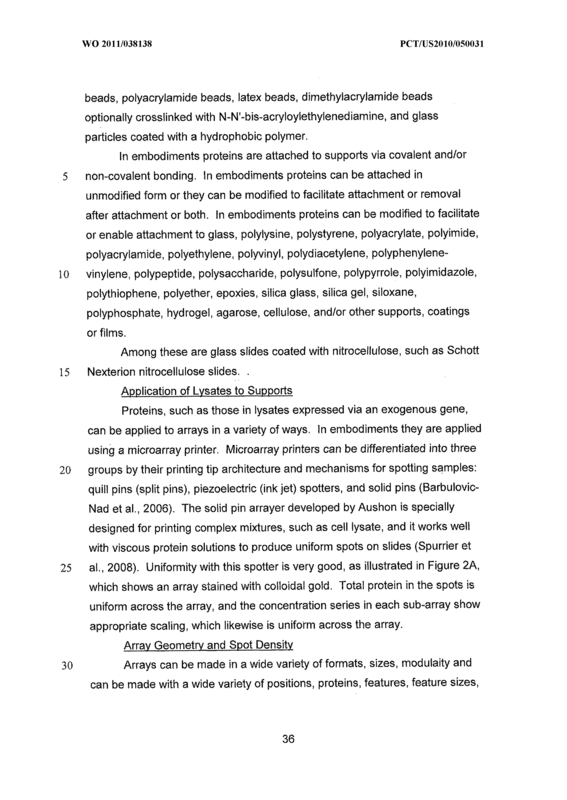 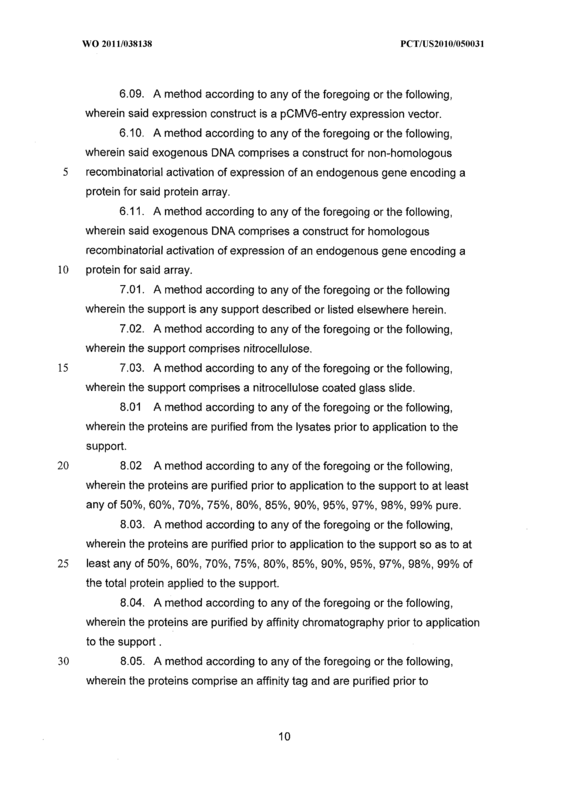 A method according to any of claims 1 through 6, wherein the proteins or the lysates are applied to nitrocellulose on a glass slide. 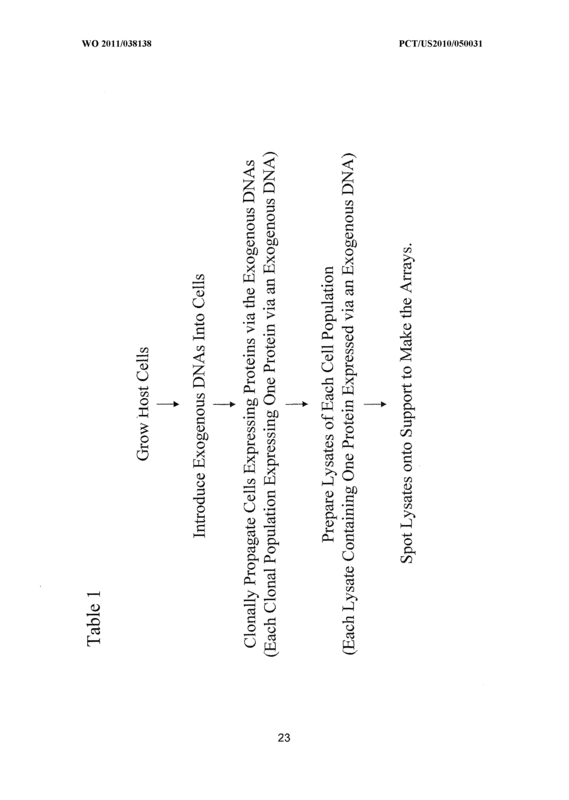 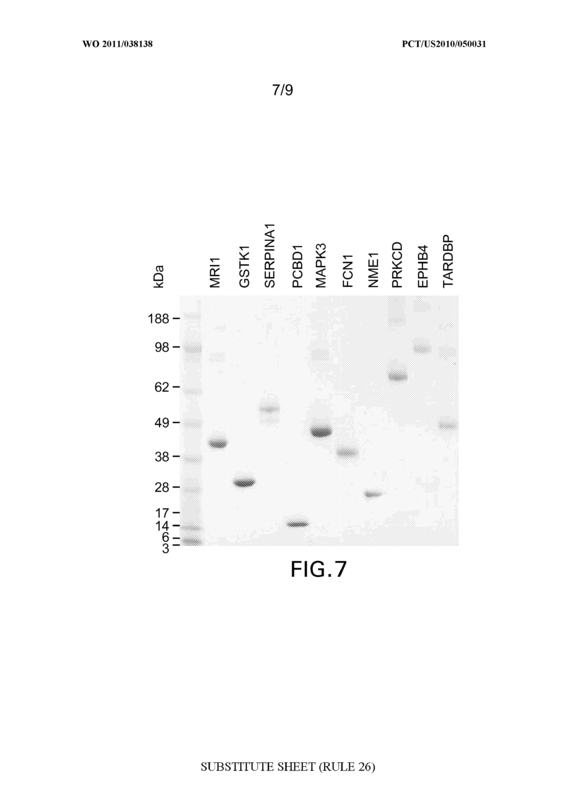 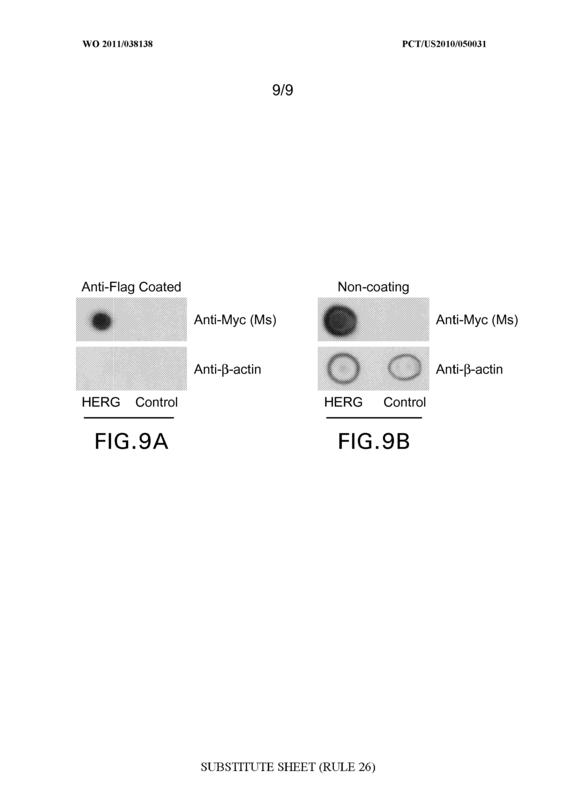 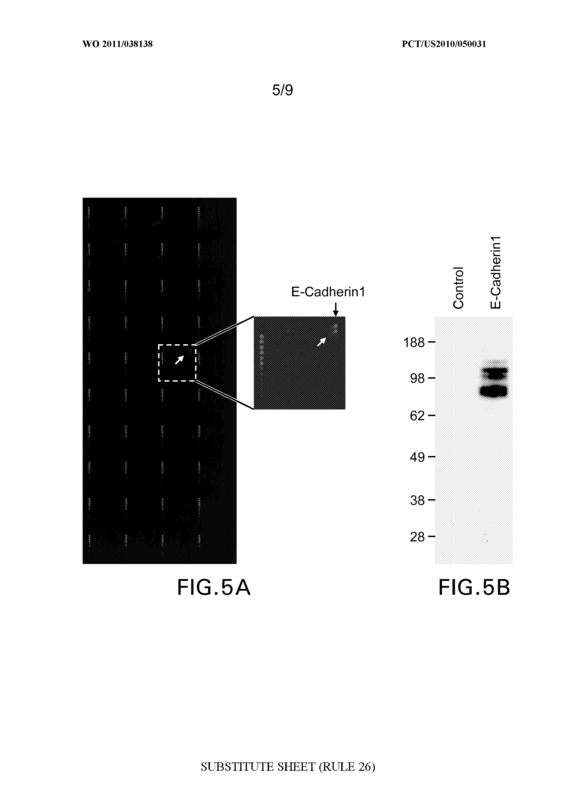 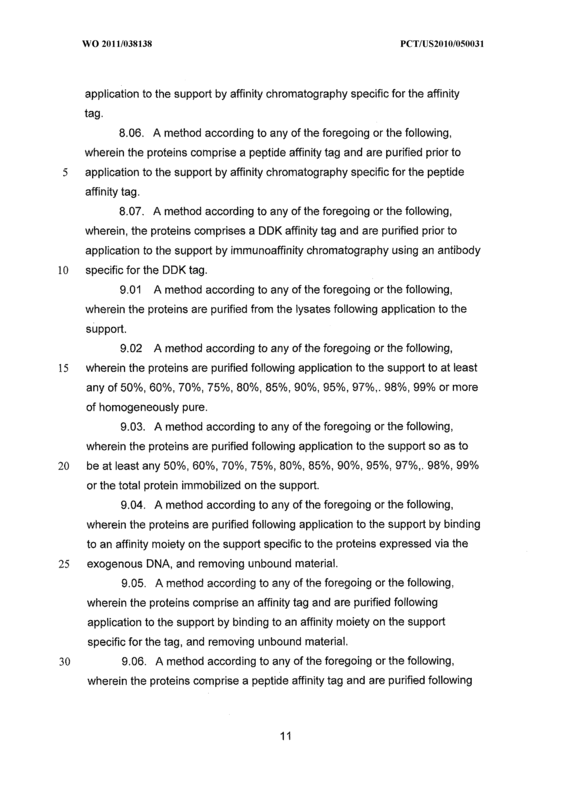 A method according to any of claims 1 through 7, wherein the support is coated with a capture reagent specific for an affinity tag and the proteins comprise the tag and are purified by binding to the capture reagent. 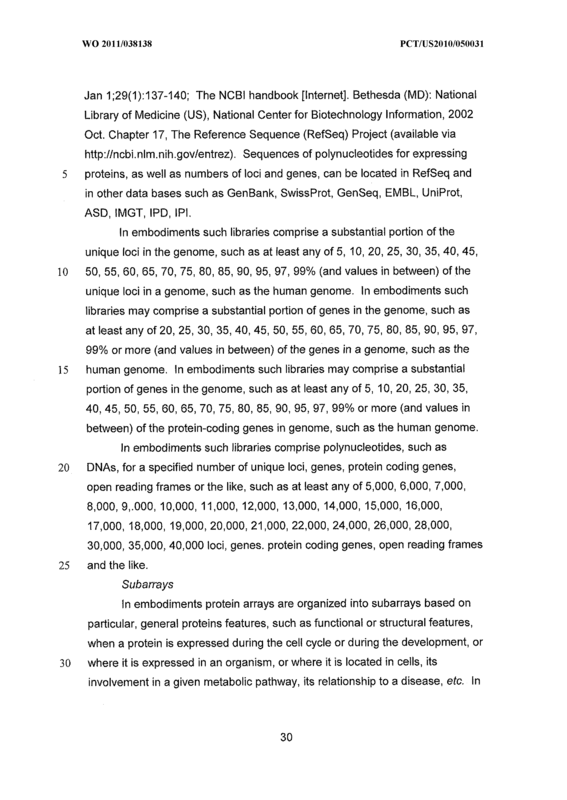 A protein array according to claim 9 or 10, wherein the proteins comprise at least 1 ,000 different loci of an organism. 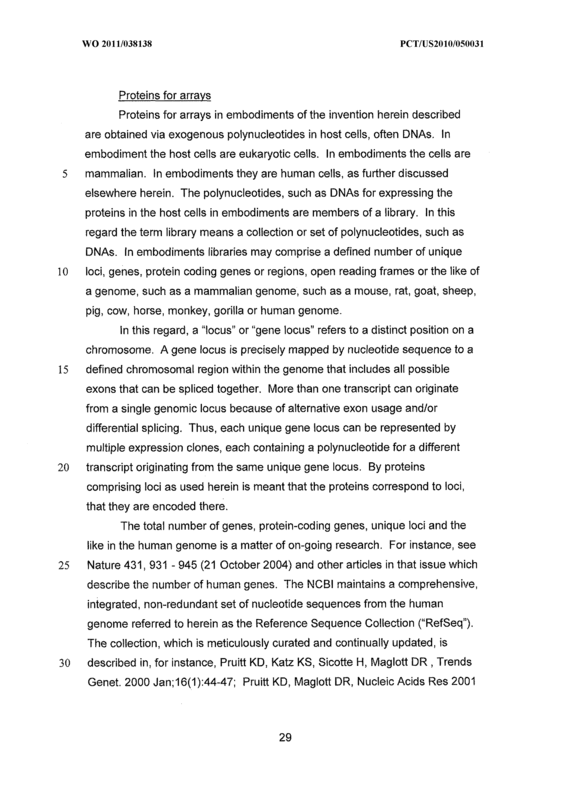 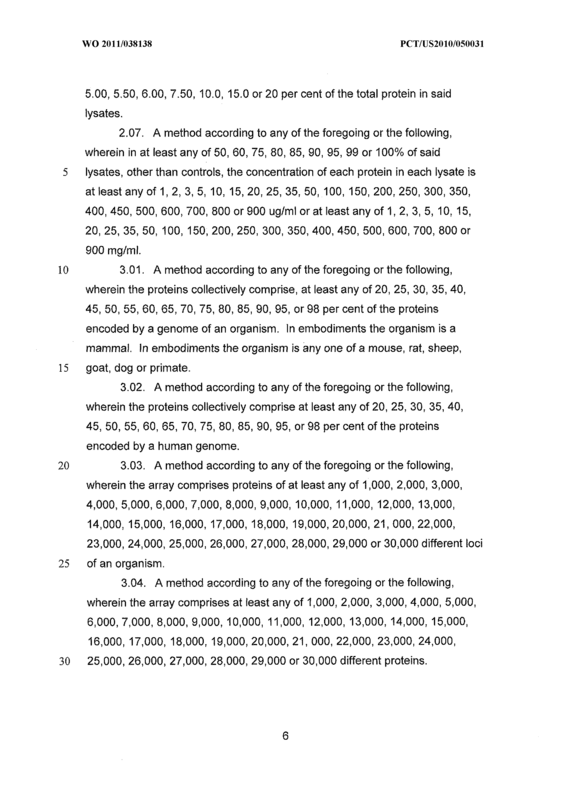 A protein array according to claim any of claims 9 through 11 , wherein the proteins collectively comprise at least 20 per cent of the proteins encoded by the genome of an organism. 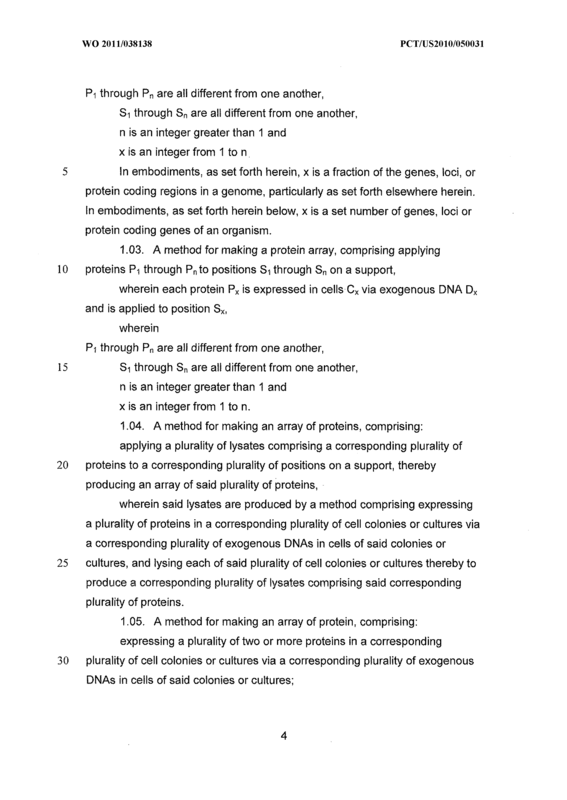 A protein array according to any of claims 9 through 12, wherein the genome is a human genome 14, A protein array according to any of c!aims 9 through 13, wherein for at least 50 per cent of said lysates, the amount of lysate protein applied to each position in the array is the amount of total protein in at least 00 cells of the lysate. 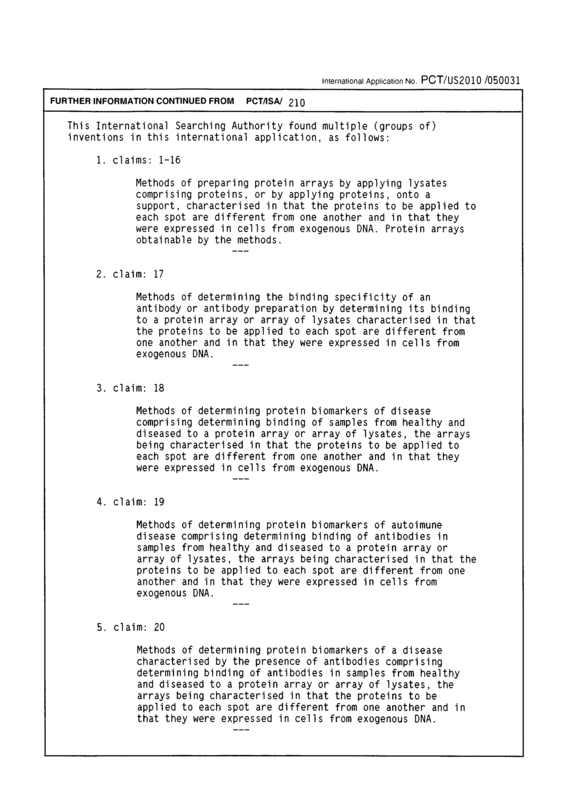 A protein array according to any of claims 9 through 4, wherein the proteins or the lysates are applied to nitrocellulose on a glass slide. 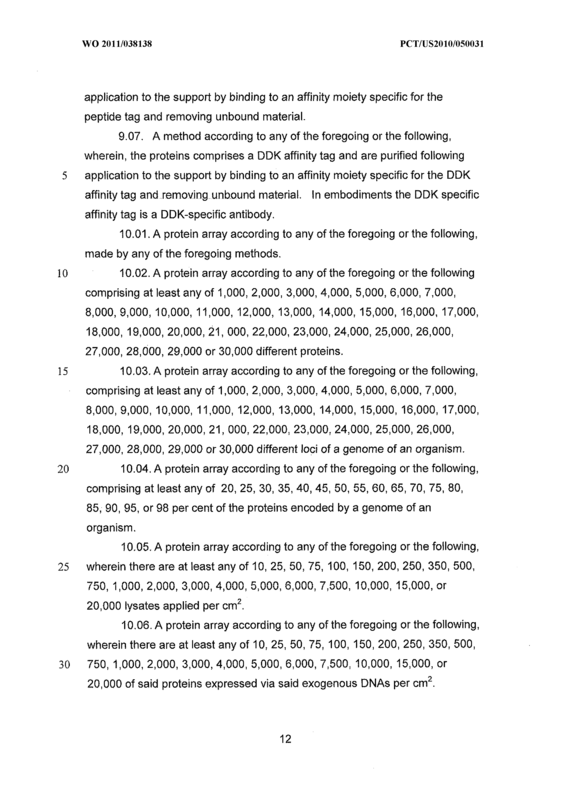 A protein array according to any of claims 9 through 15, wherein the proteins comprise an affinity tag and are bound to the support by a capture reagent specific for the affinity tag immobilized therein. 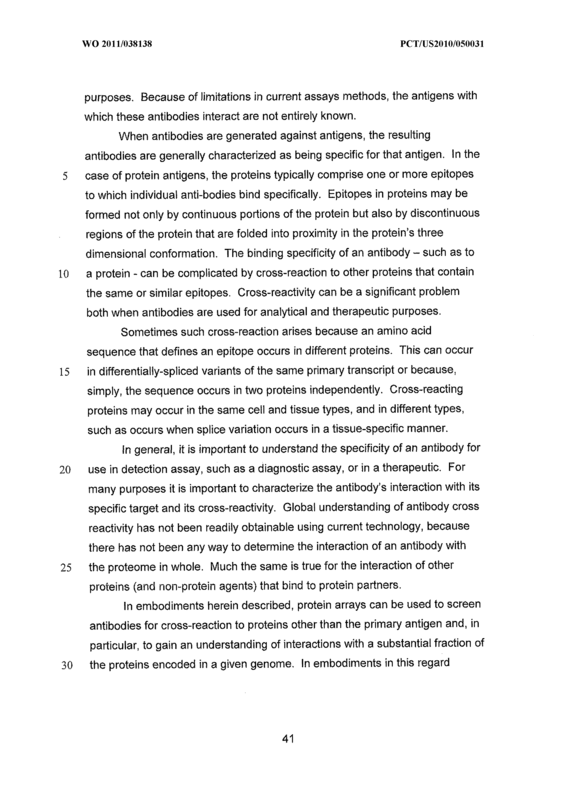 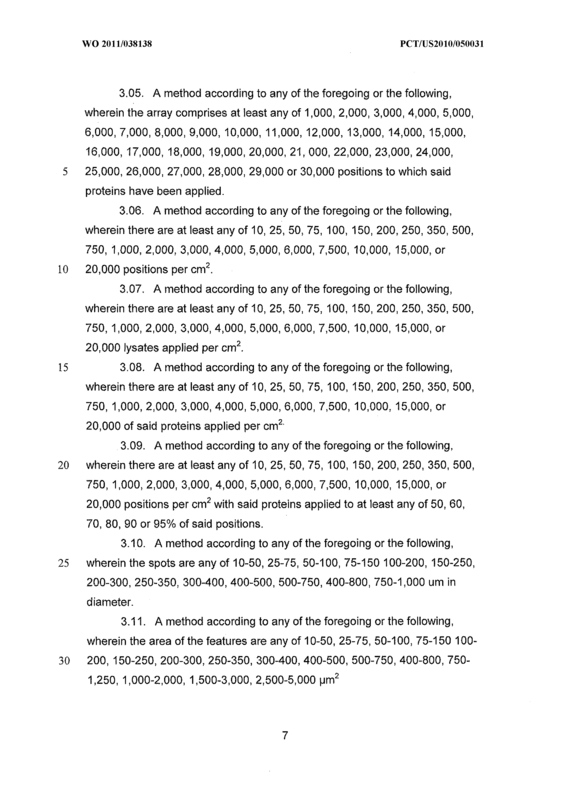 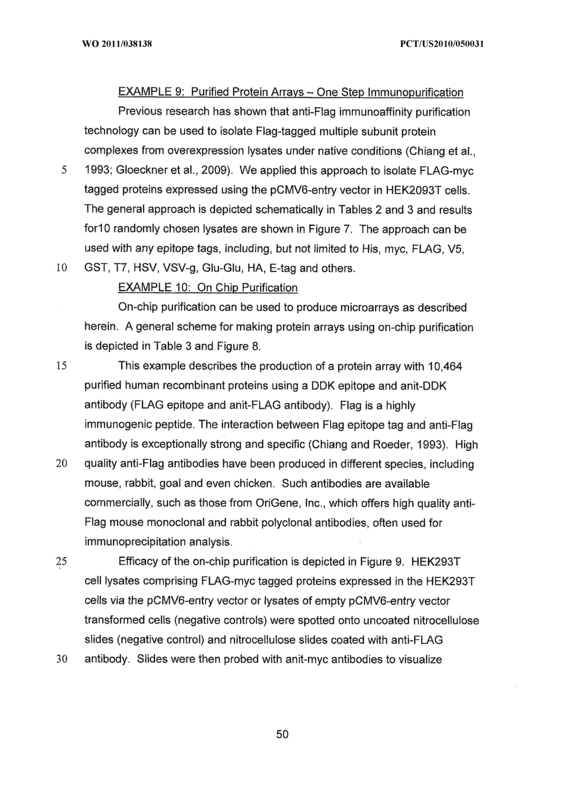 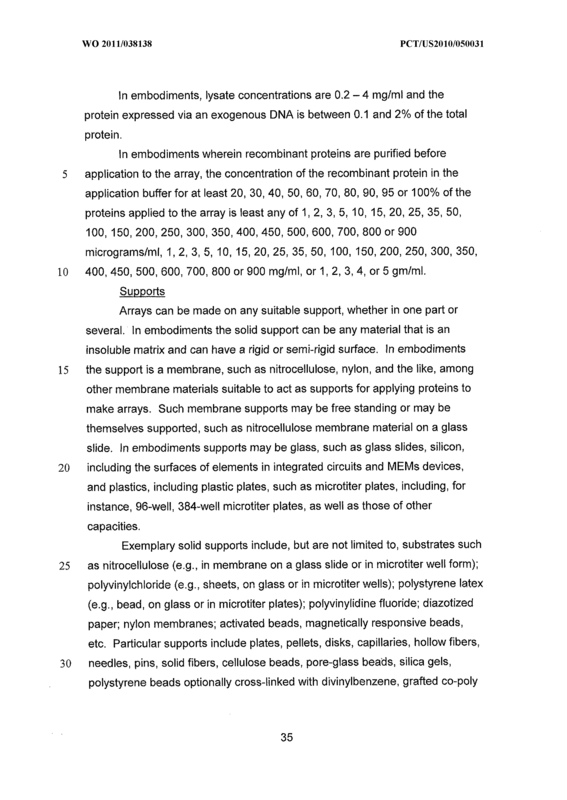 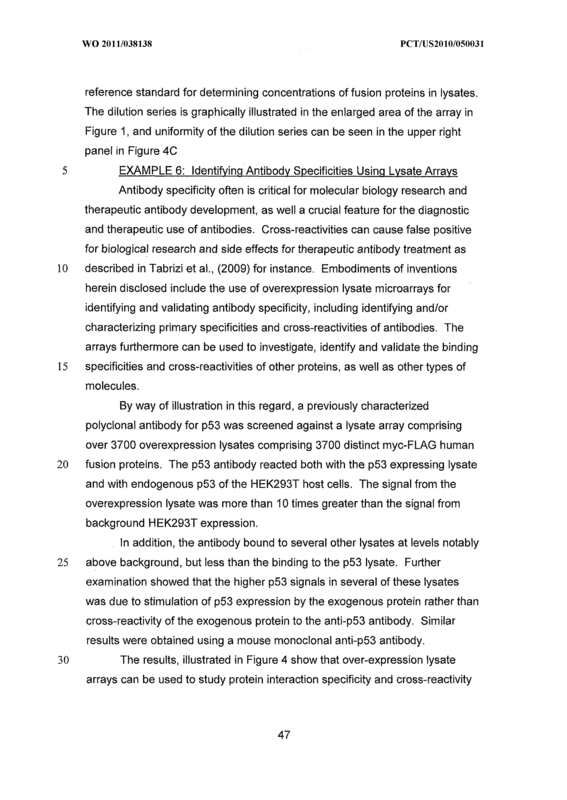 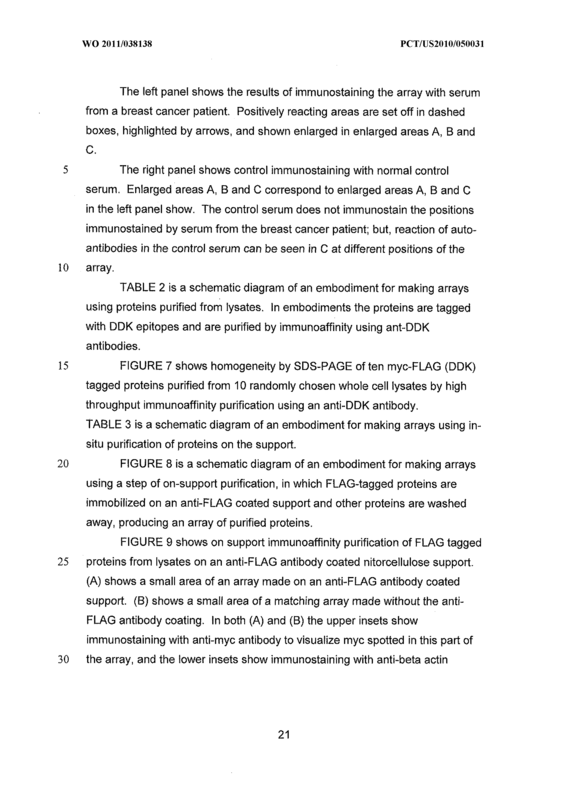 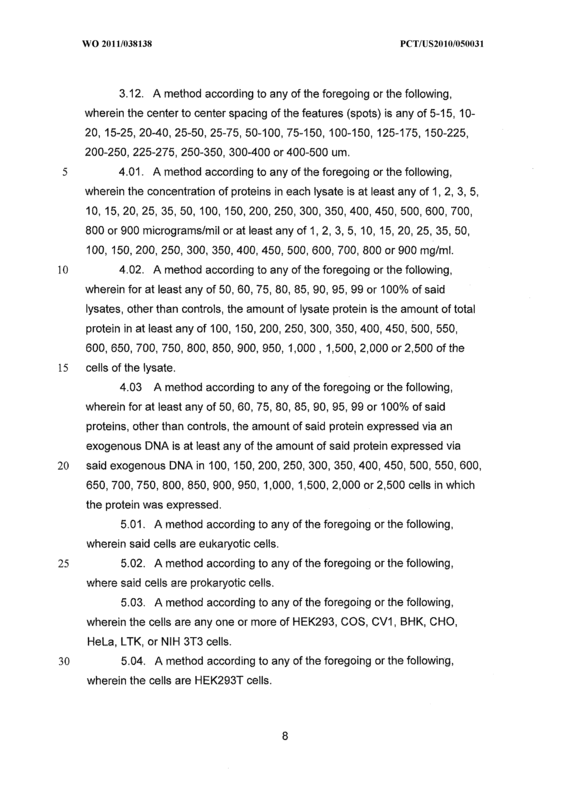 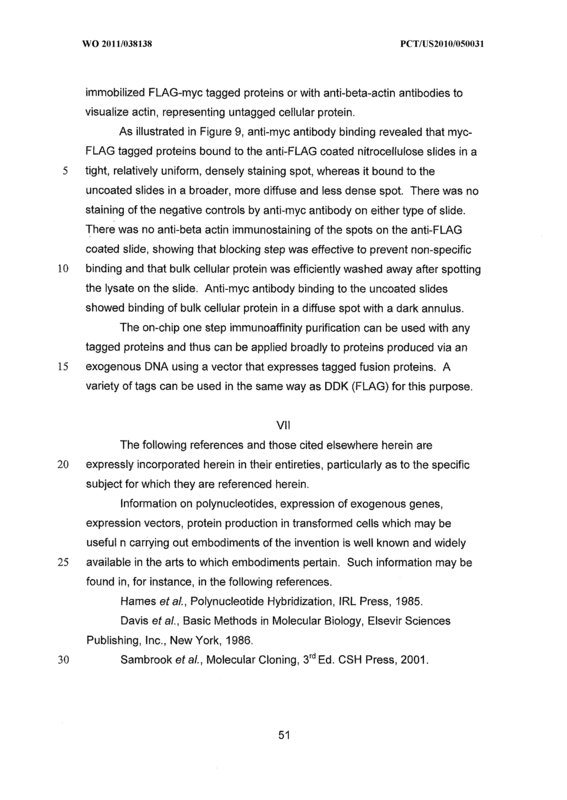 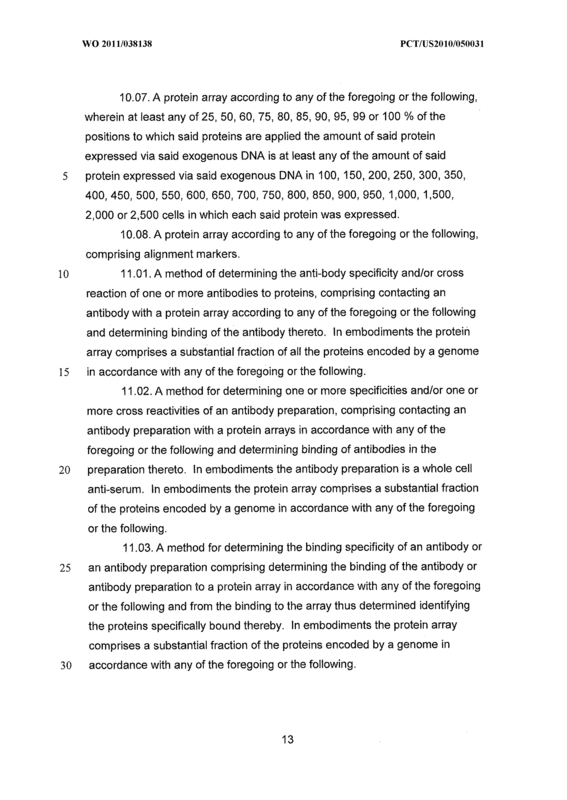 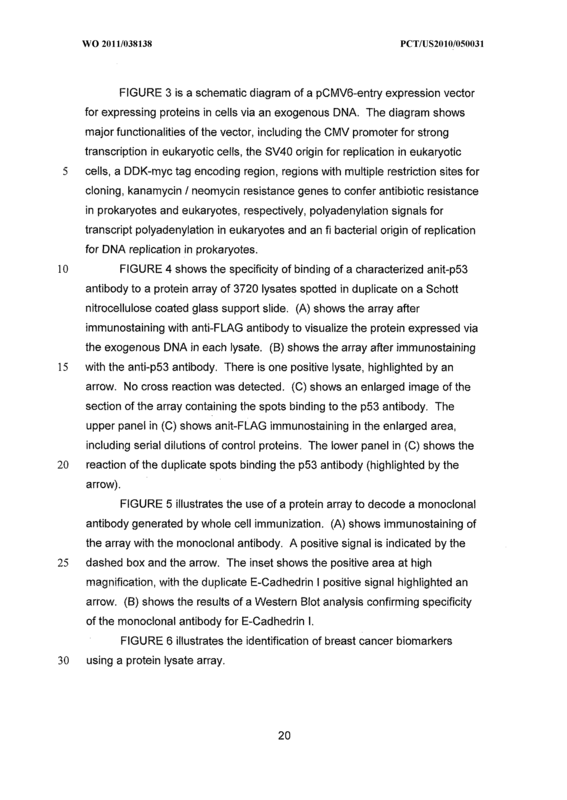 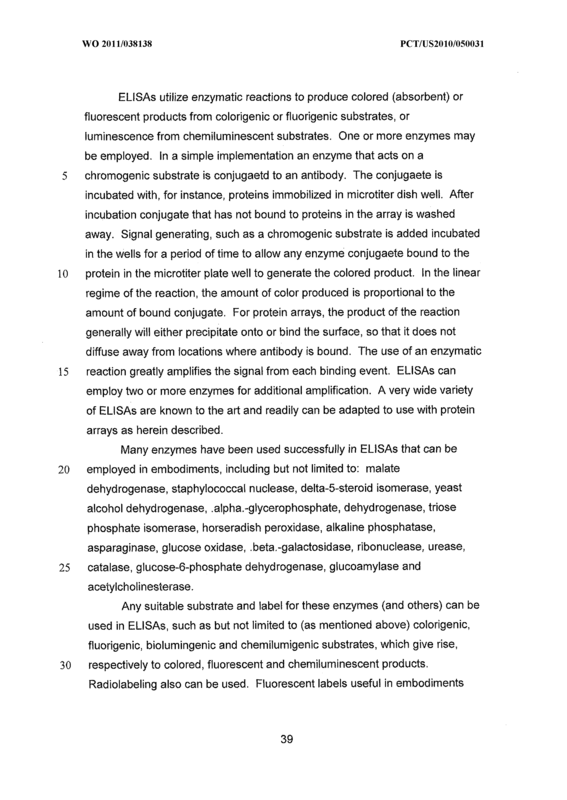 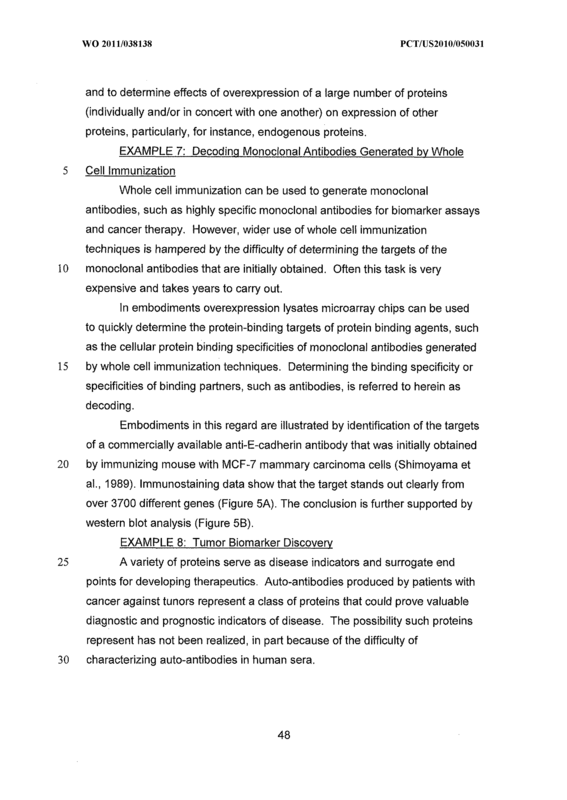 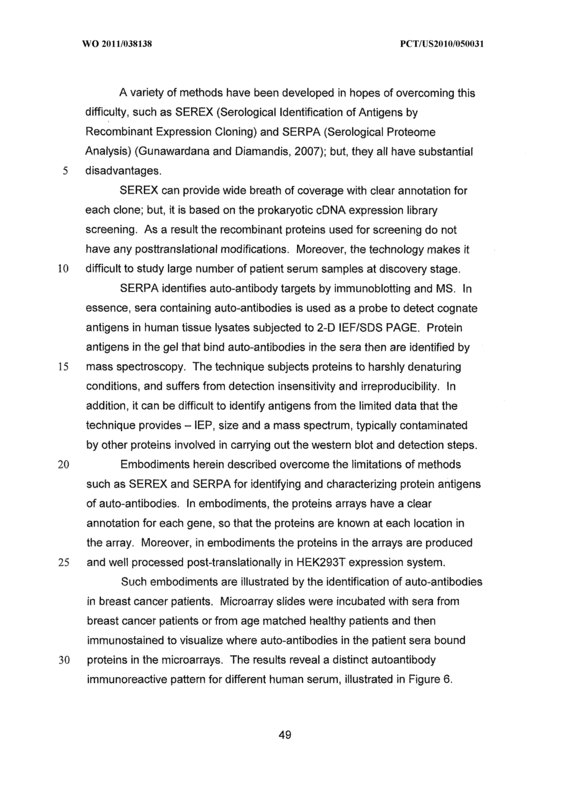 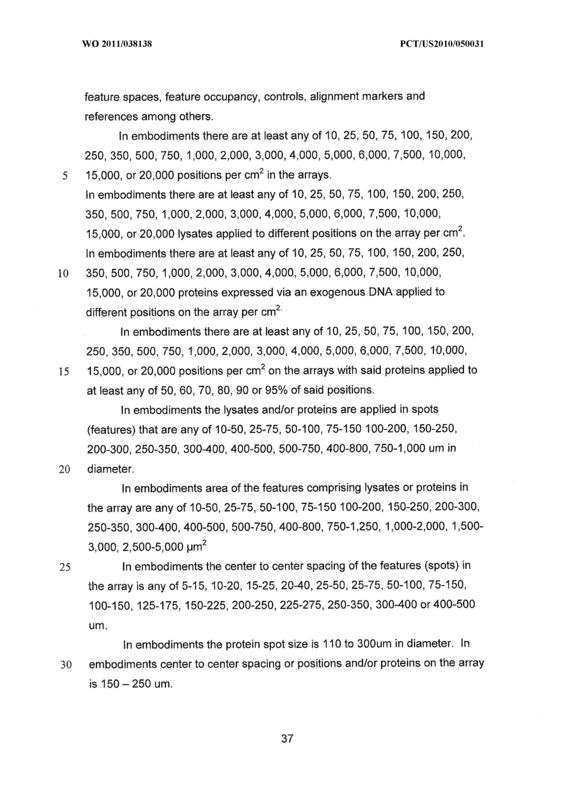 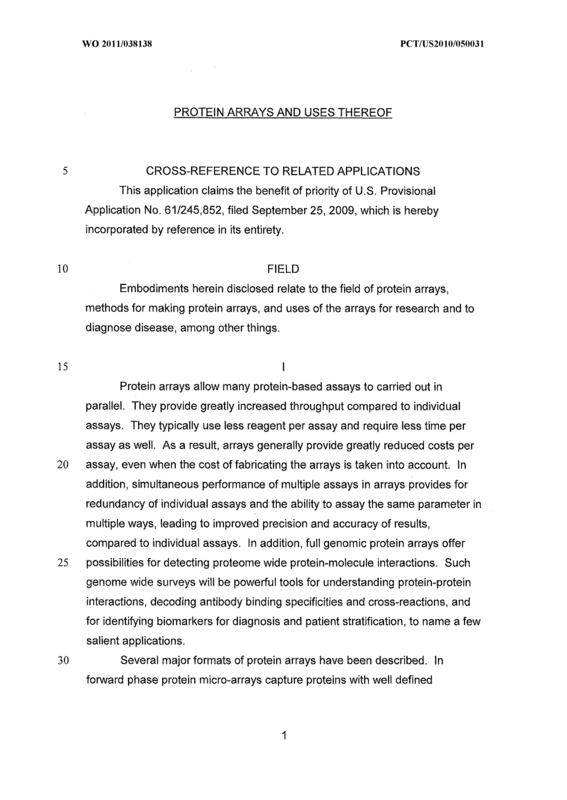 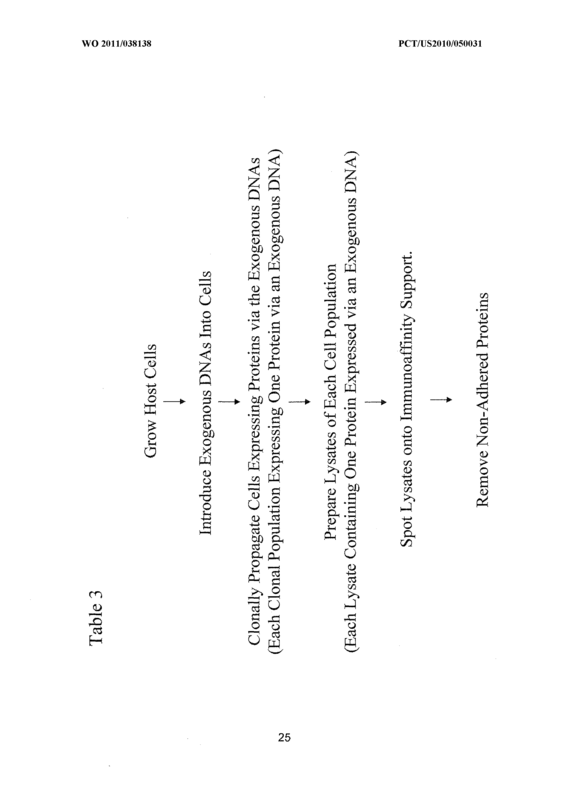 A method for determining the binding specificity of an antibody or antibody preparation comprising determining the binding of the antibody or antibody preparation to a protein array according to any of claims 9 through 16 and from the determination identifying the binding specificity of the antibody or antibody preparation for proteins in the array. 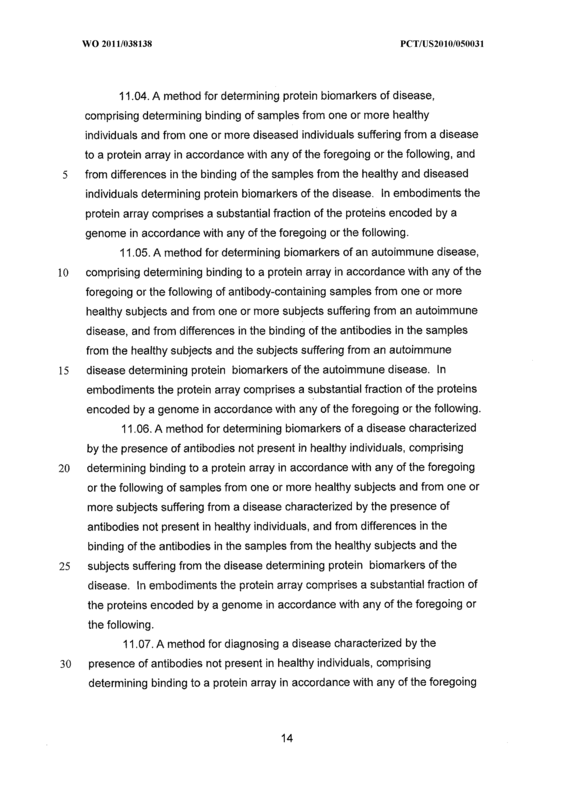 differences in the binding of the samples from the healthy and diseased individuals determining protein biomarkers of the disease. 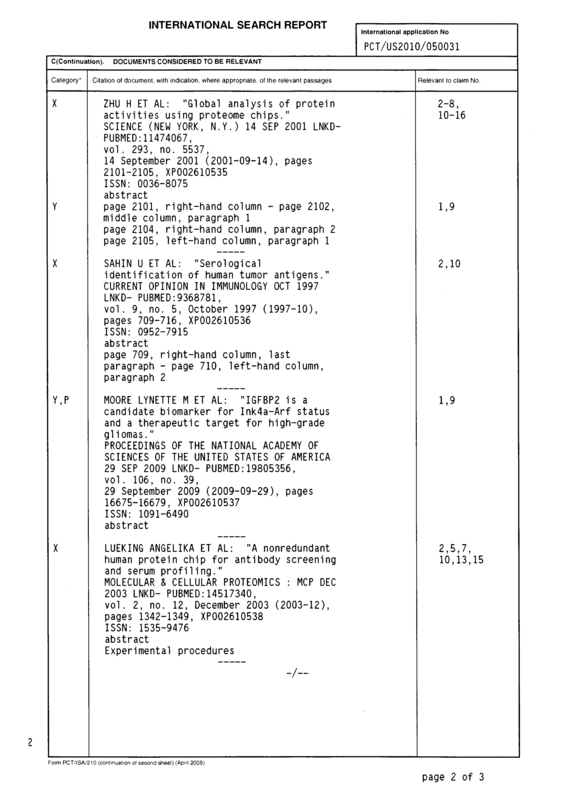 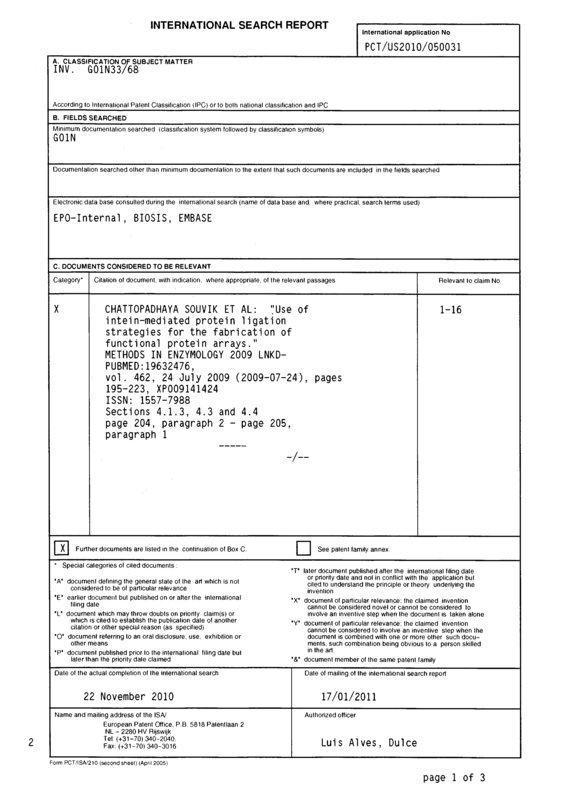 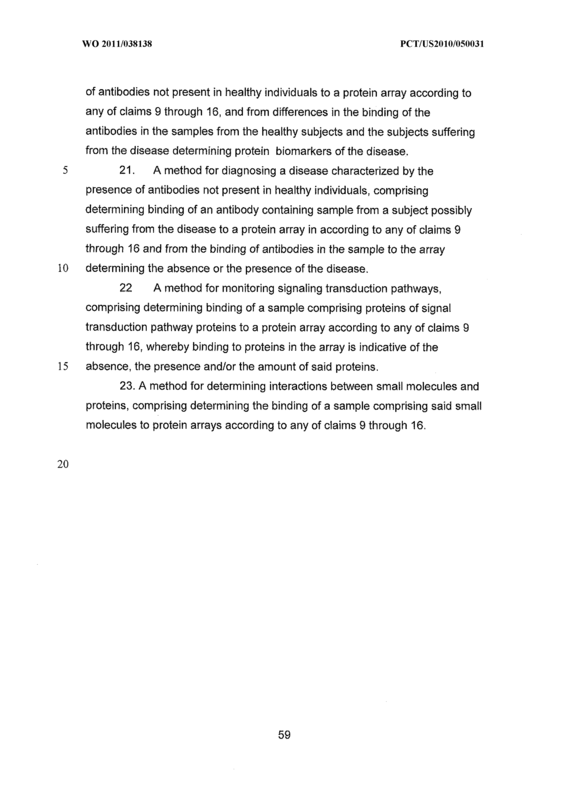 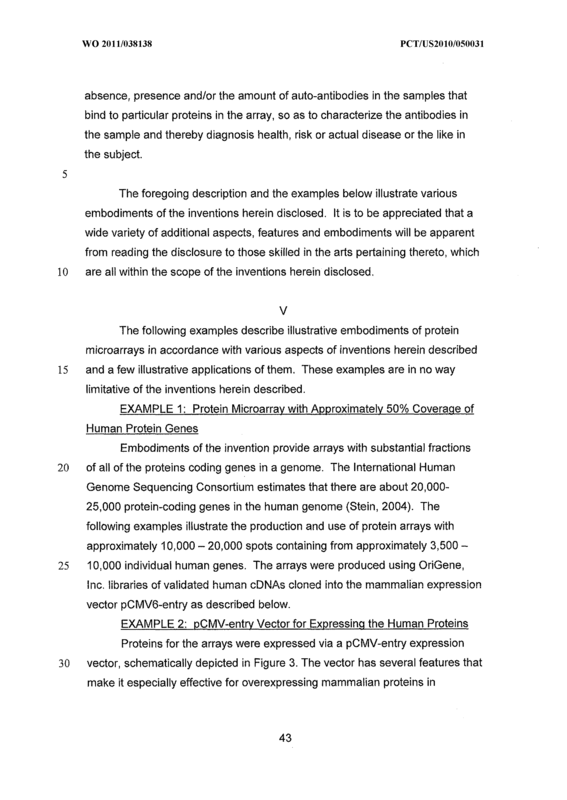 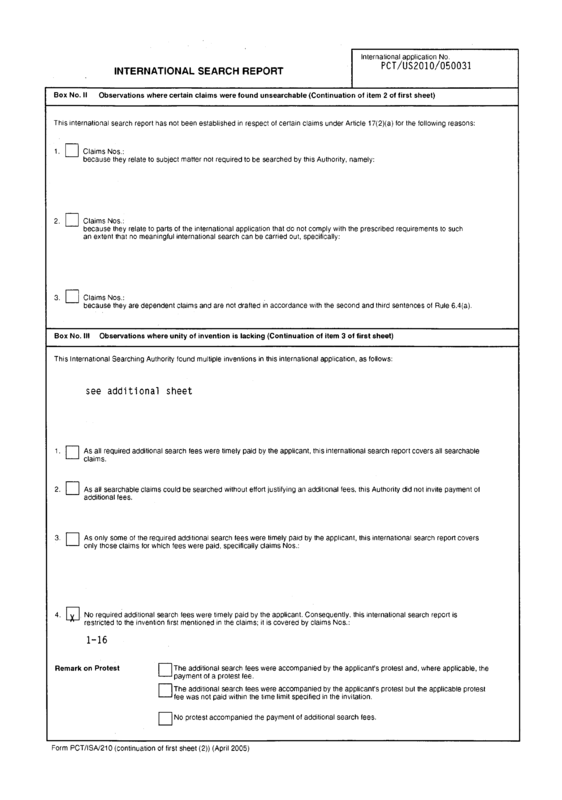 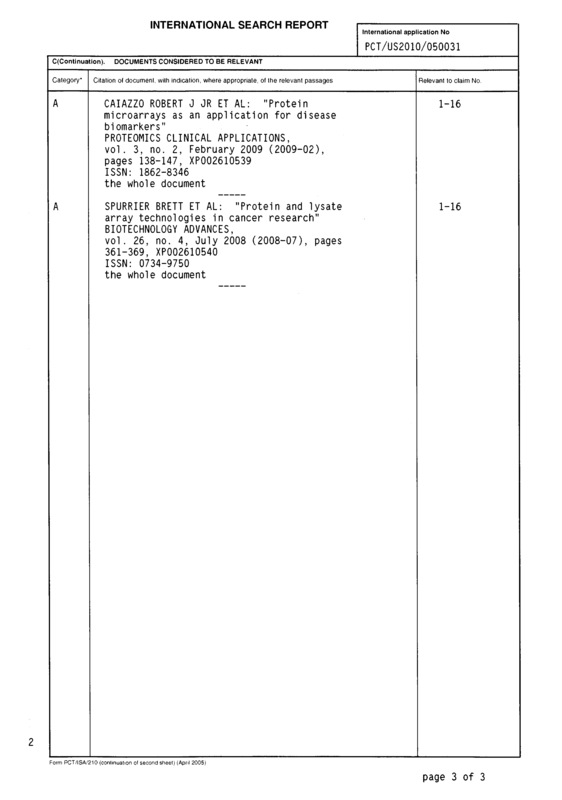 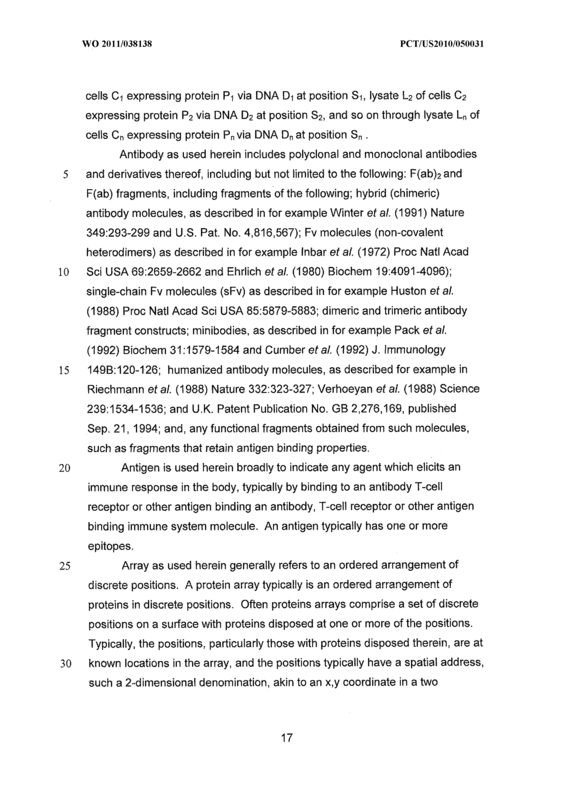 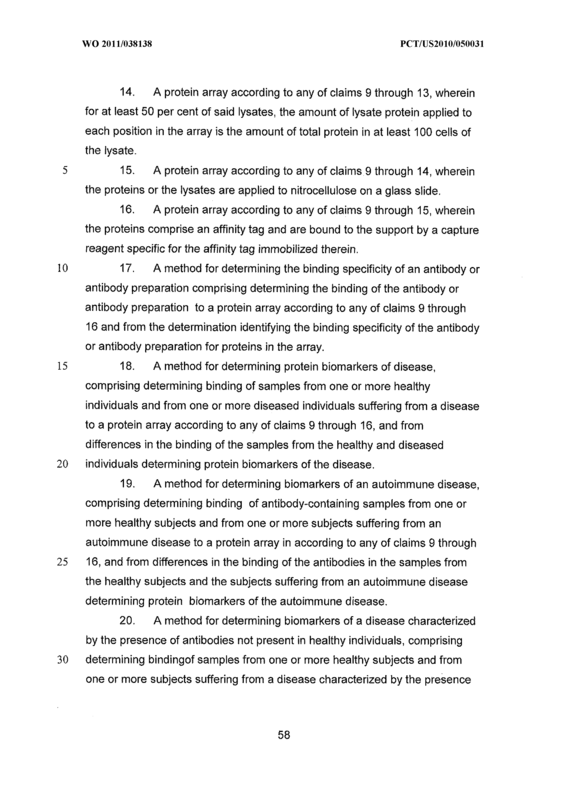 A method for determining biomarkers of an autoimmune disease, comprising determining binding of antibody-containing samples from one or more healthy subjects and from one or more subjects suffering from an autoimmune disease to a protein array in according to any of claims 9 through 16, and from differences in the binding of the antibodies in the samples from the healthy subjects and the subjects suffering from an autoimmune disease determining protein biomarkers of the autoimmune disease. 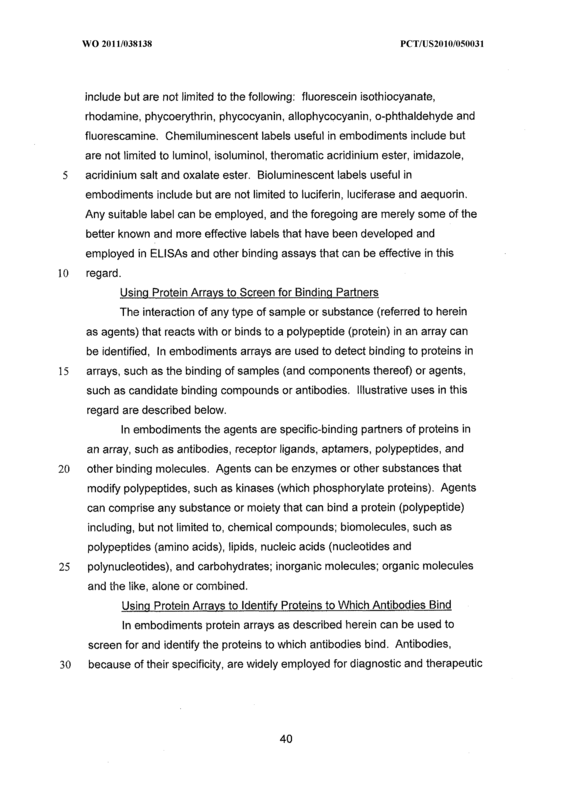 antibodies in the samples from the healthy subjects and the subjects suffering from the disease determining protein biomarkers of the disease. 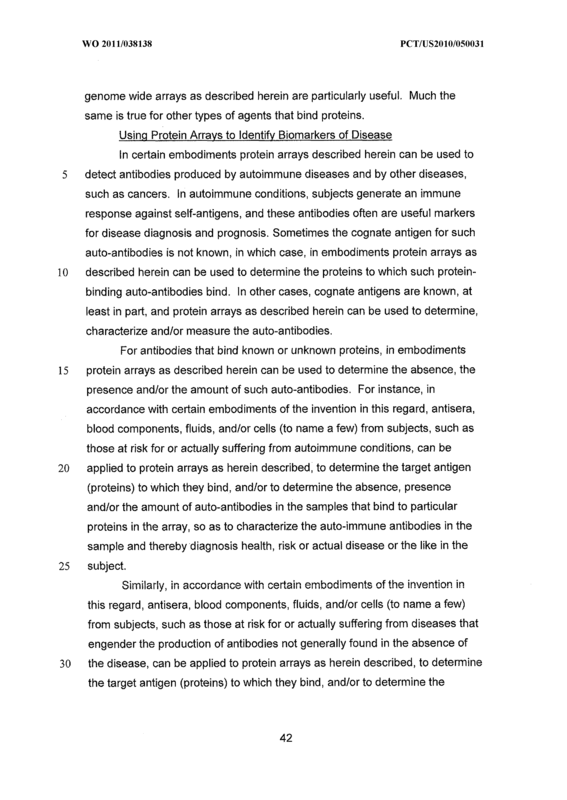 determining binding of an antibody containing sample from a subject possibly suffering from the disease to a protein array in according to any of claims 9 through 16 and from the binding of antibodies in the sample to the array determining the absence or the presence of the disease. 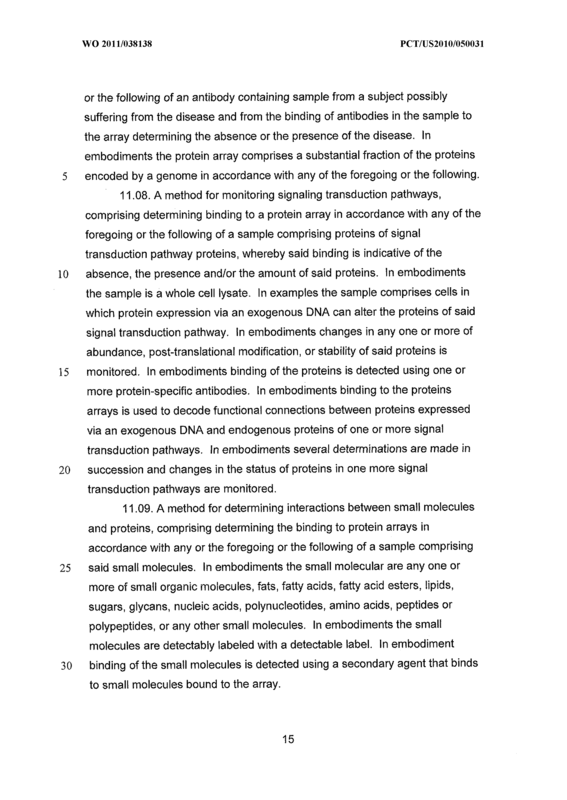 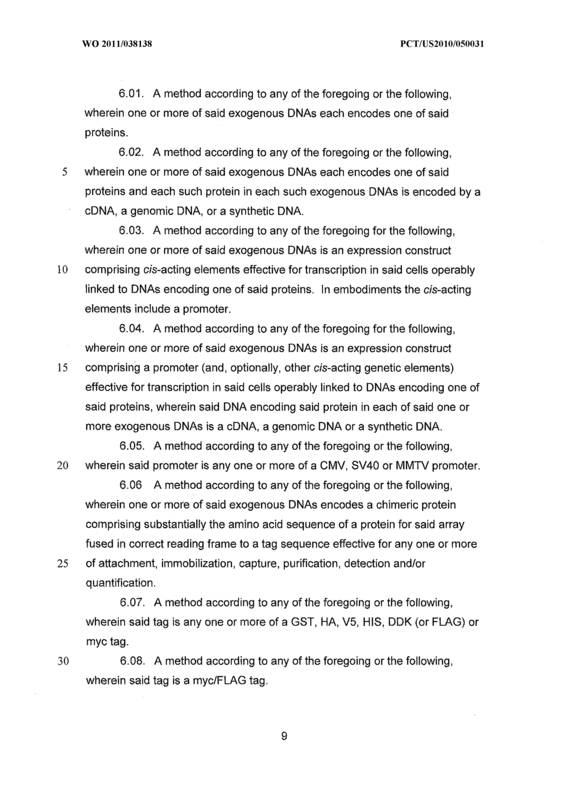 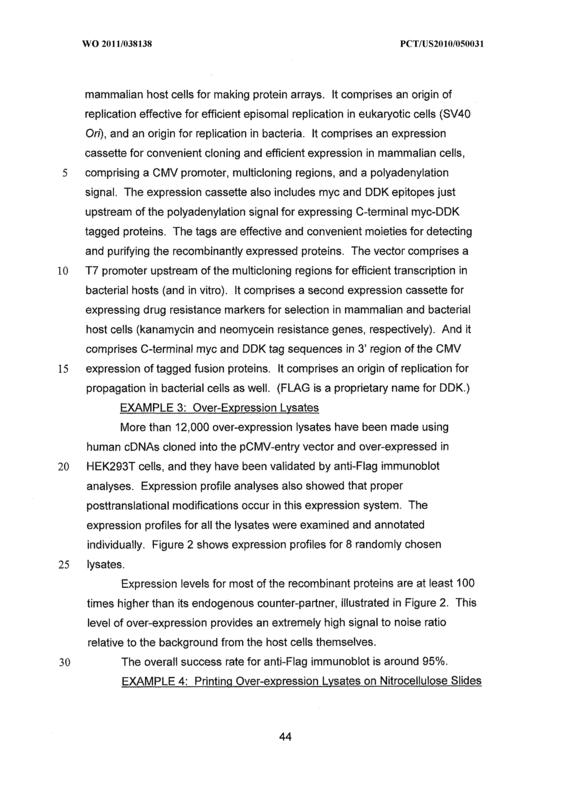 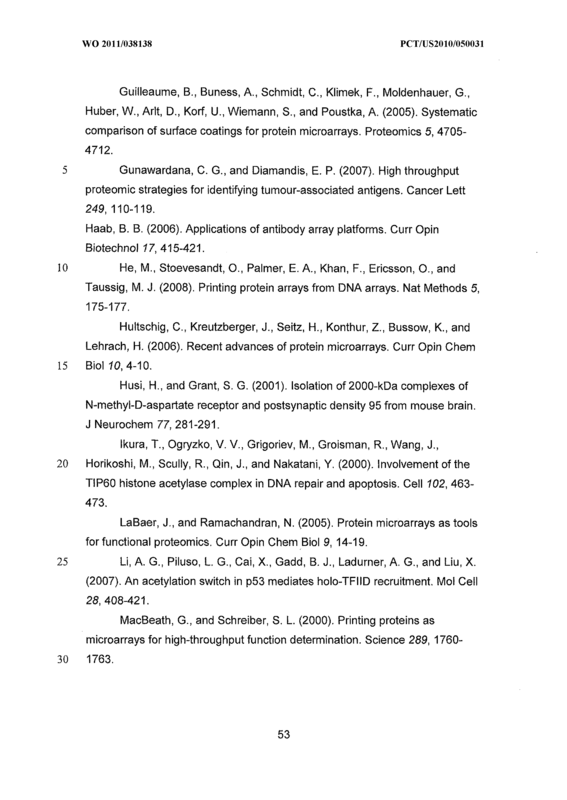 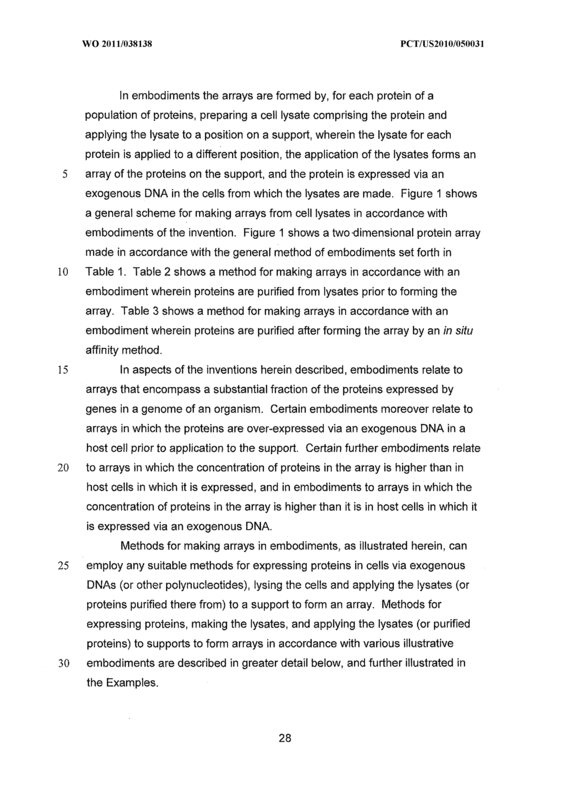 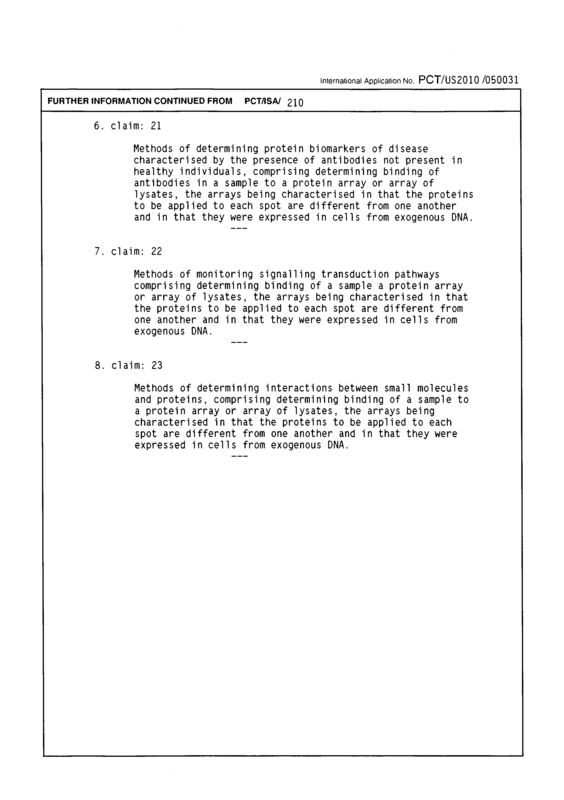 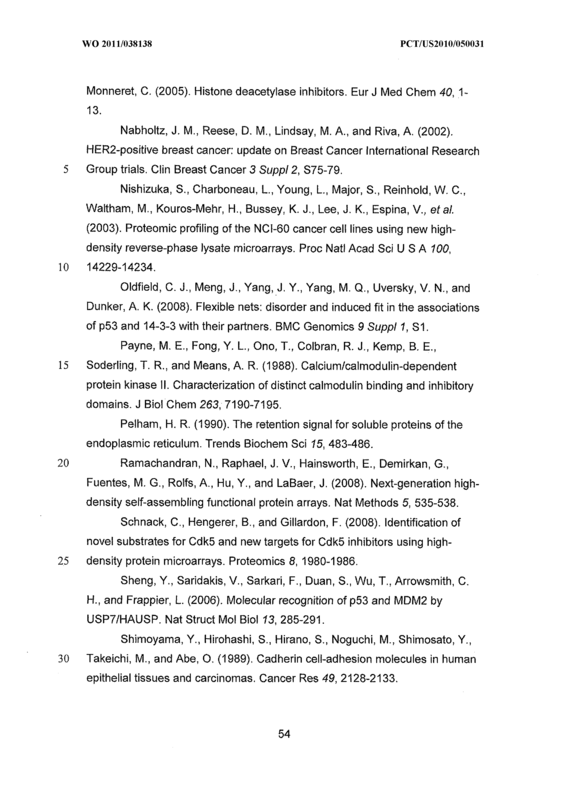 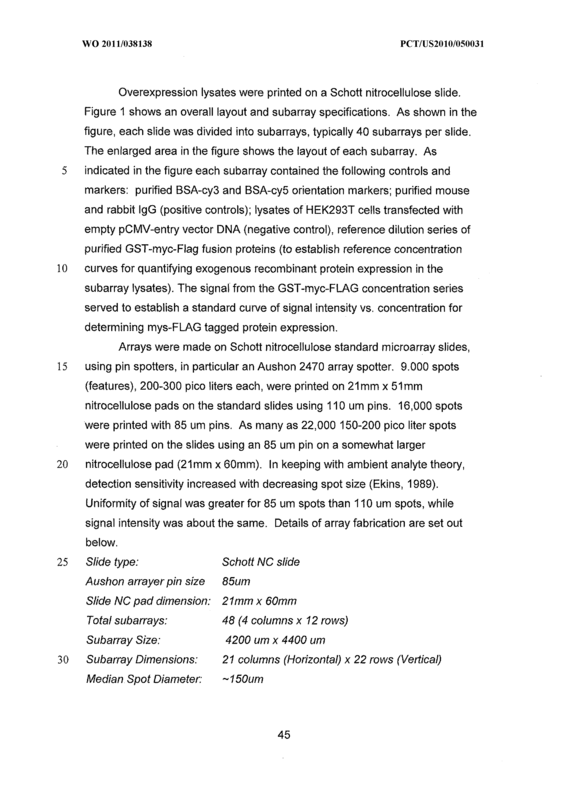 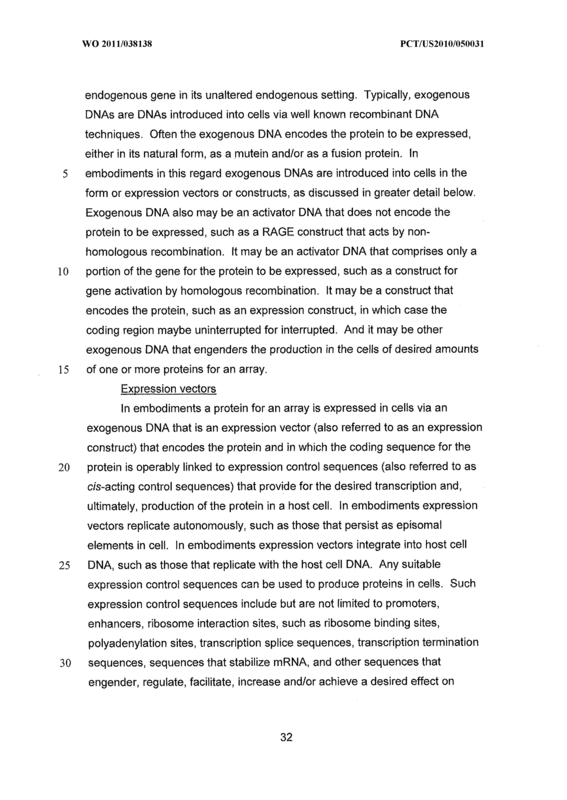 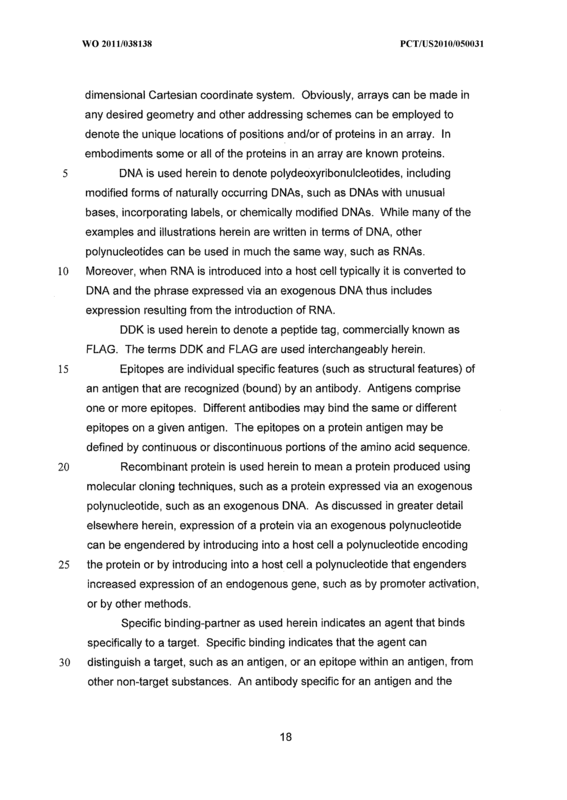 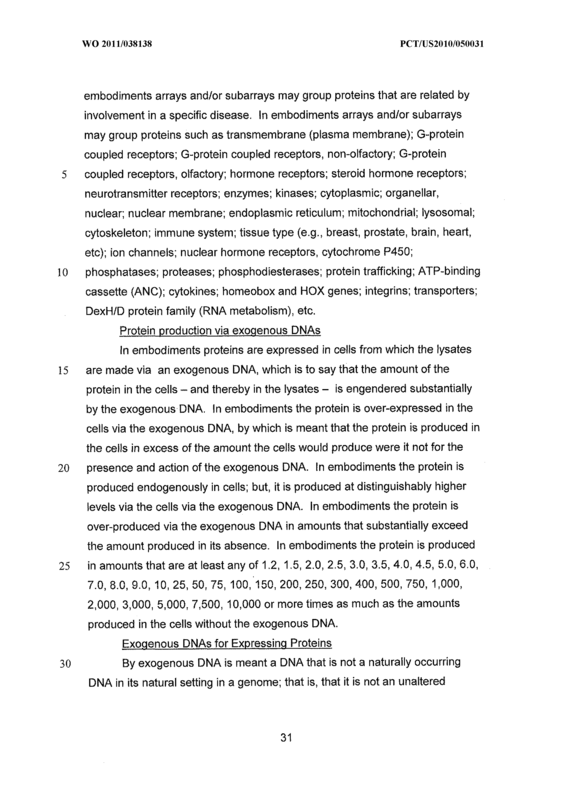 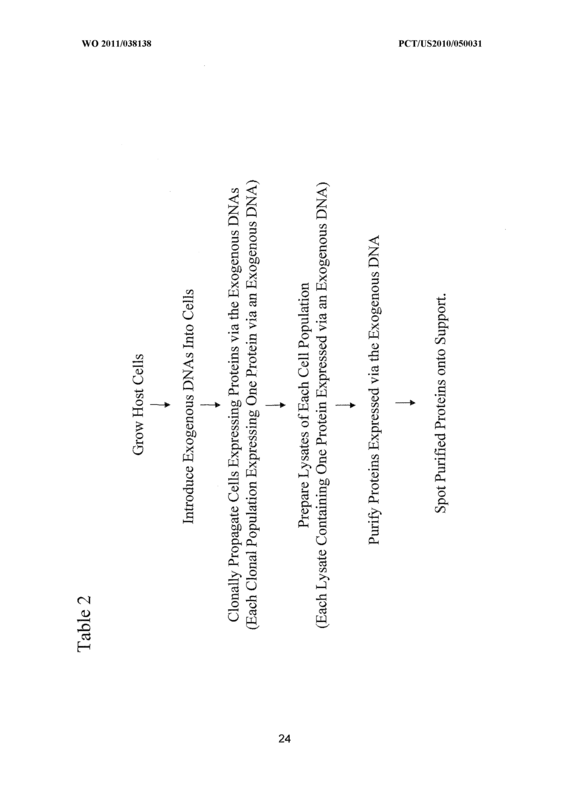 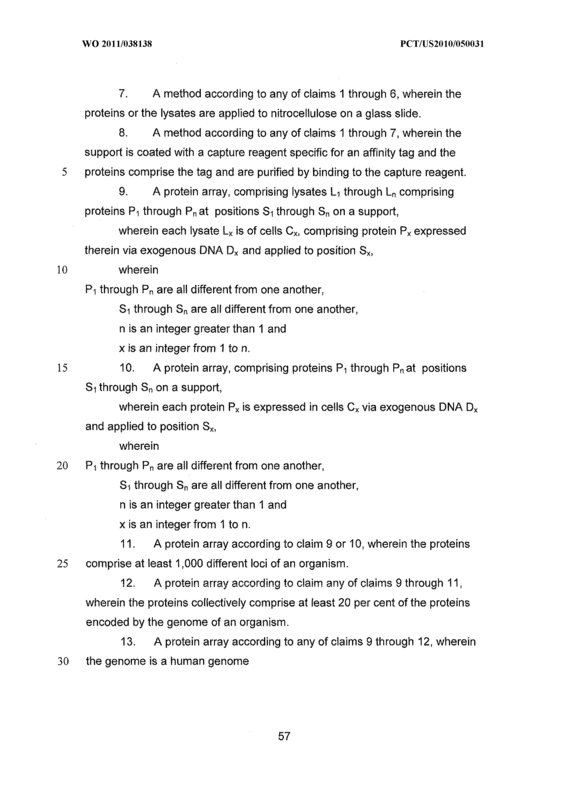 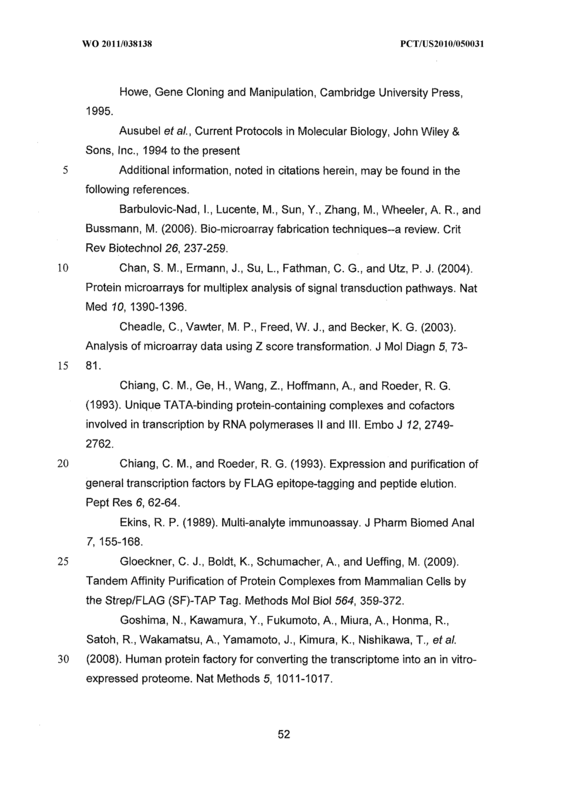 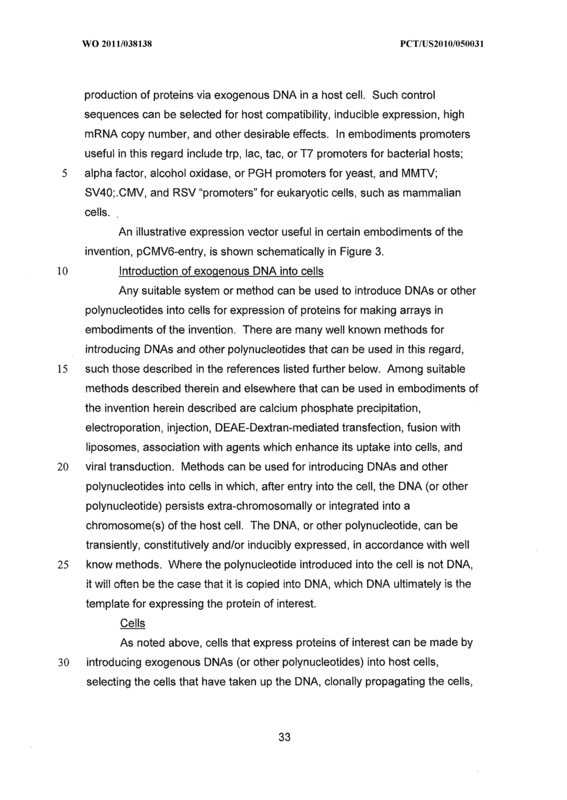 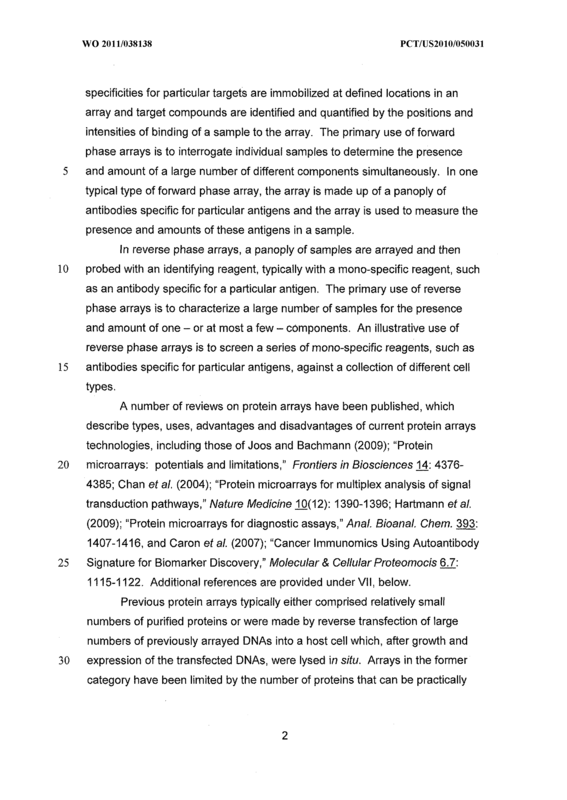 22 A method for monitoring signaling transduction pathways, comprising determining binding of a sample comprising proteins of signal transduction pathway proteins to a protein array according to any of claims 9 through 16, whereby binding to proteins in the array is indicative of the absence, the presence and/or the amount of said proteins. 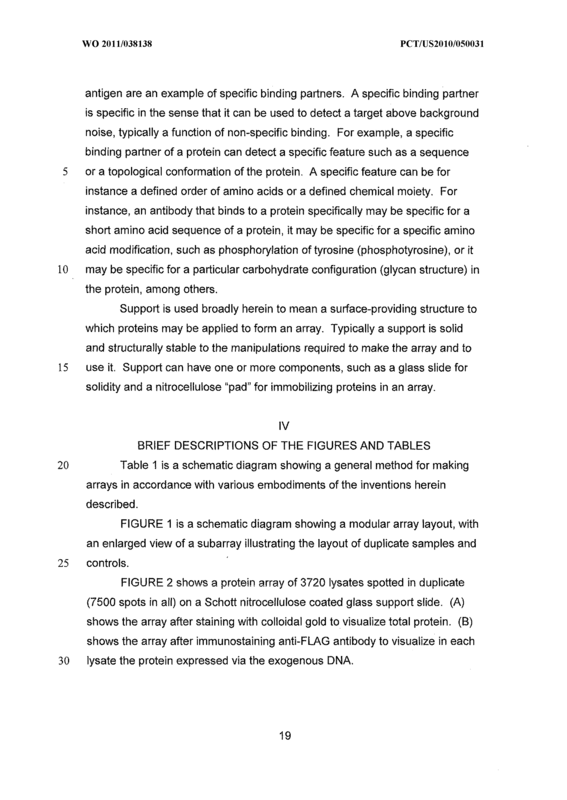 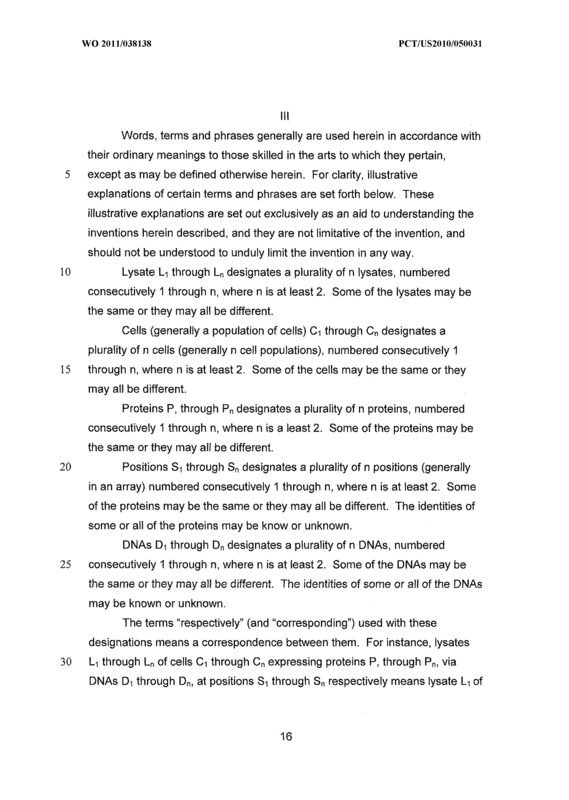 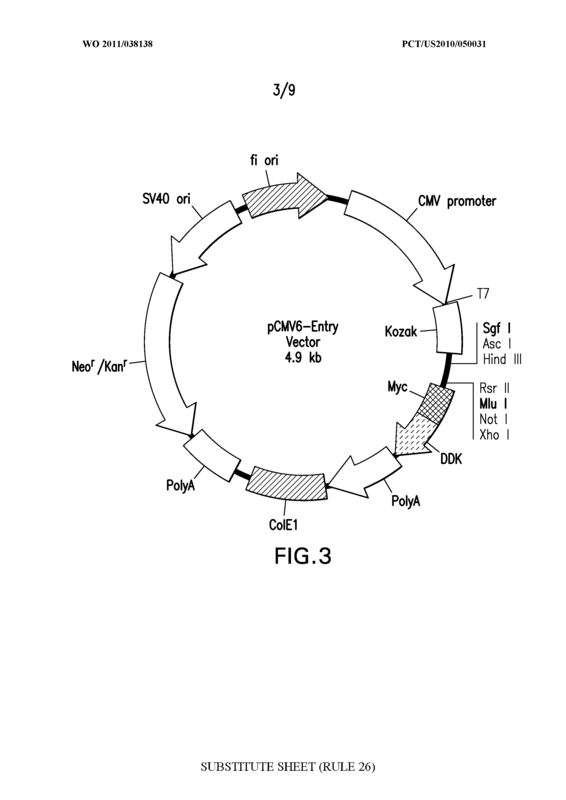 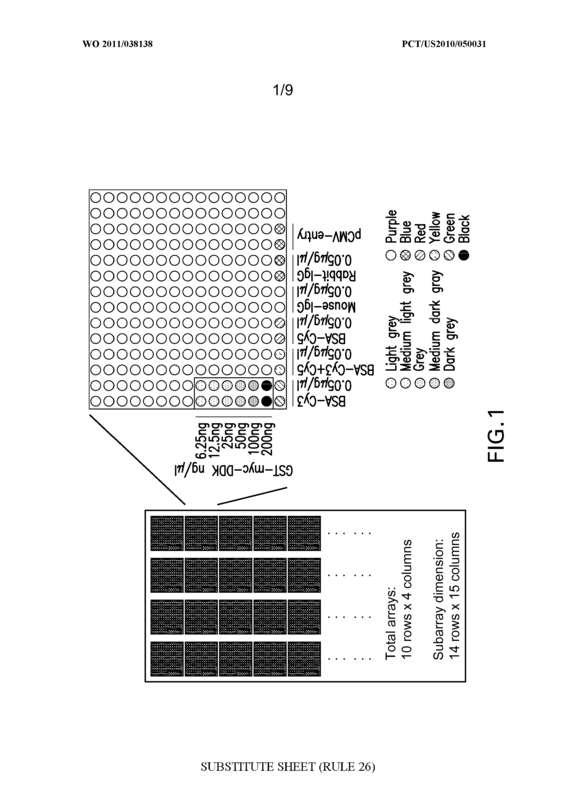 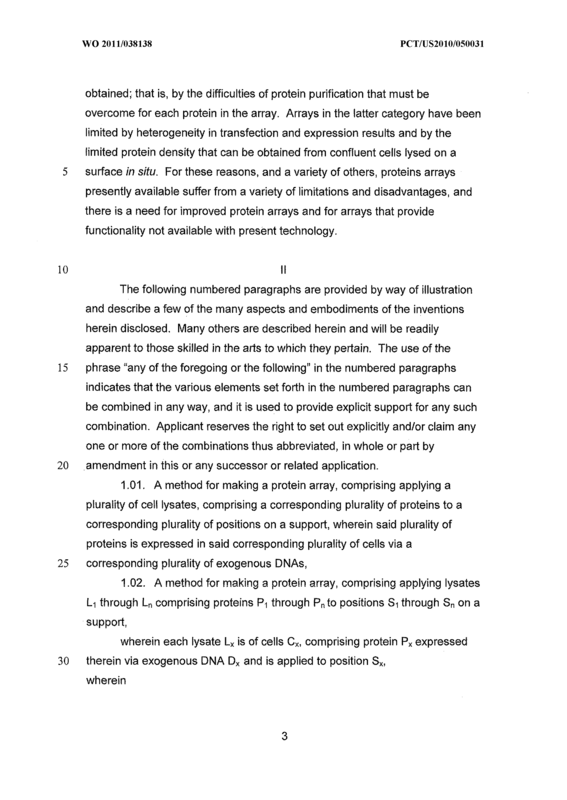 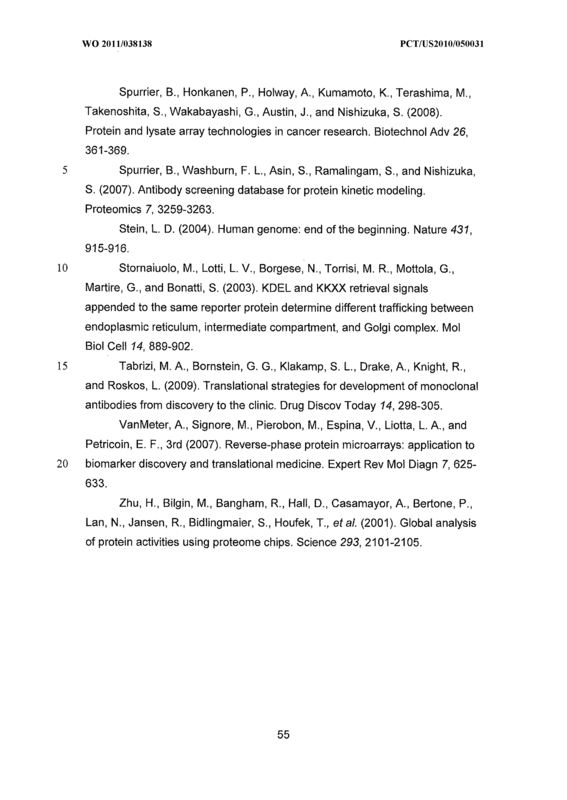 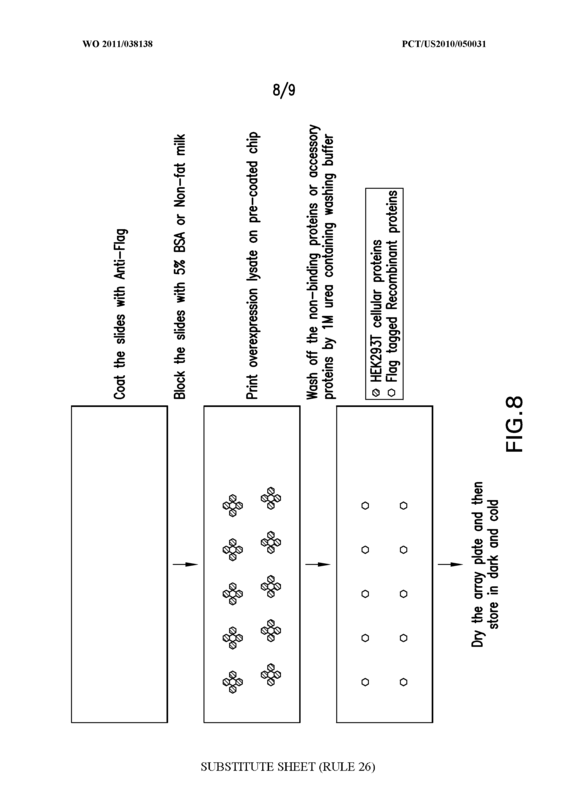 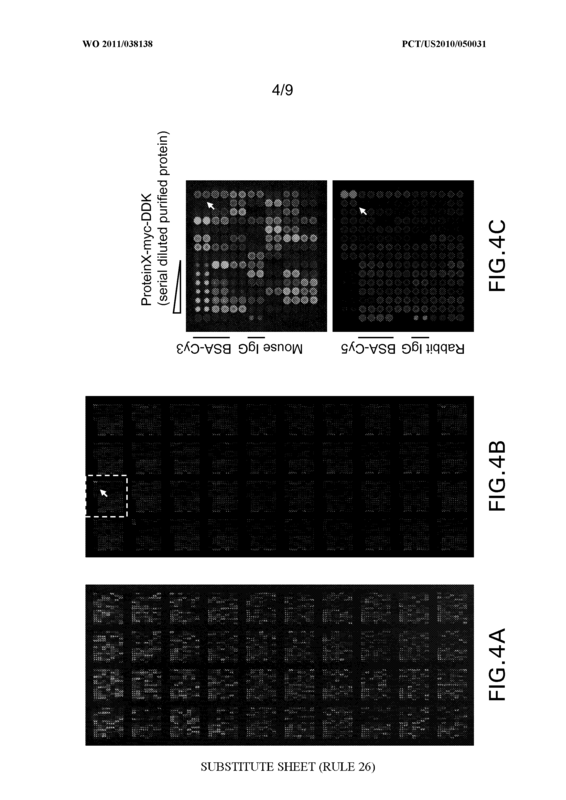 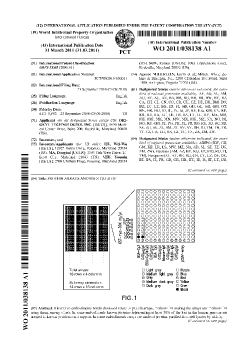 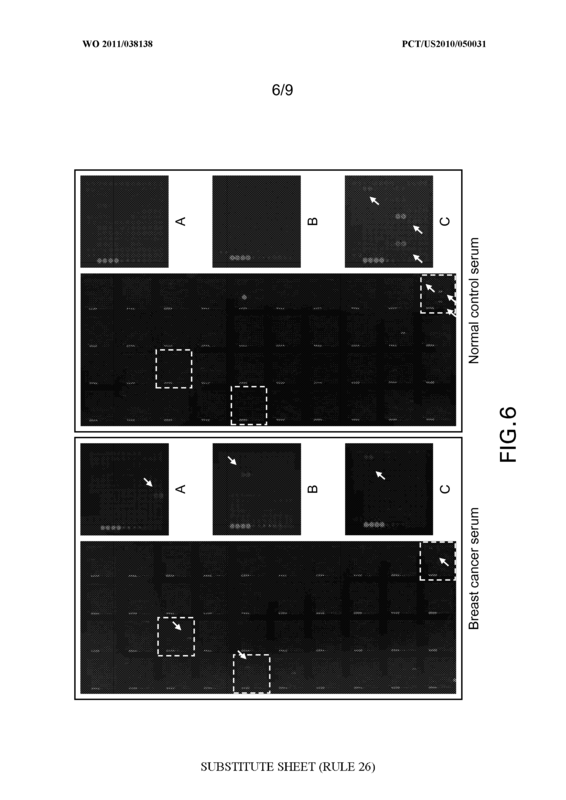 A method for determining interactions between small molecules and proteins, comprising determining the binding of a sample comprising said small molecules to protein arrays according to any of claims 9 through 16.